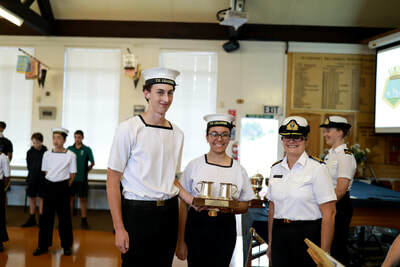 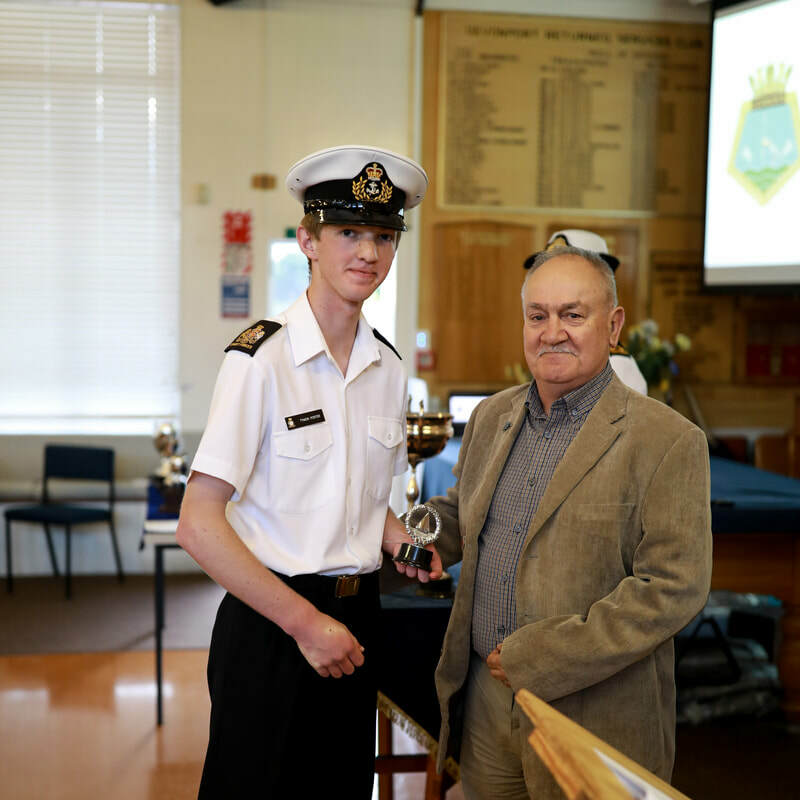 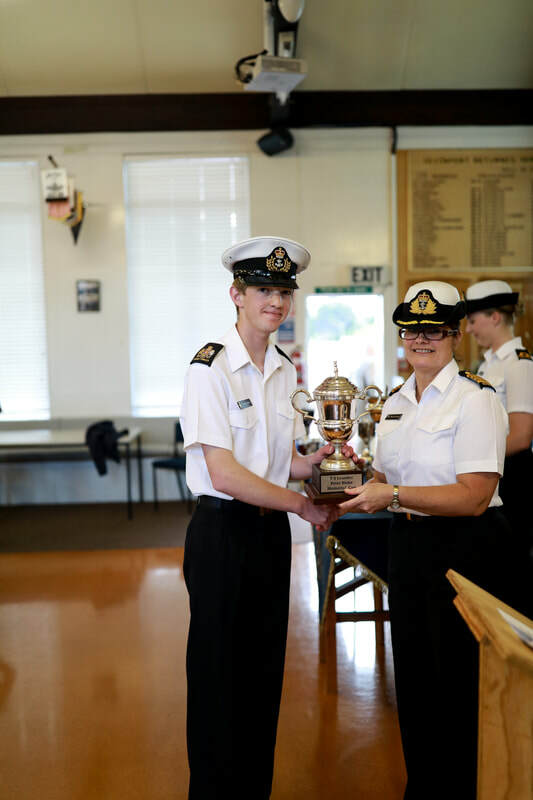 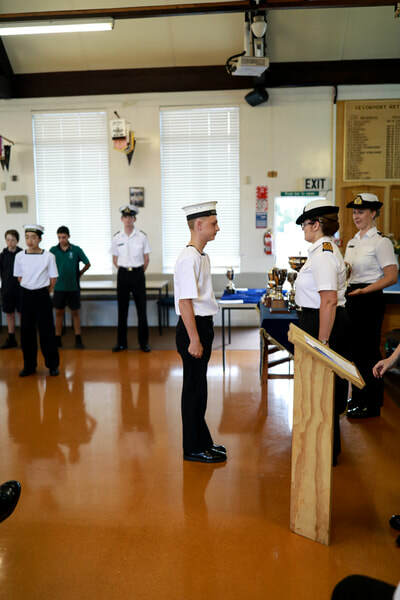 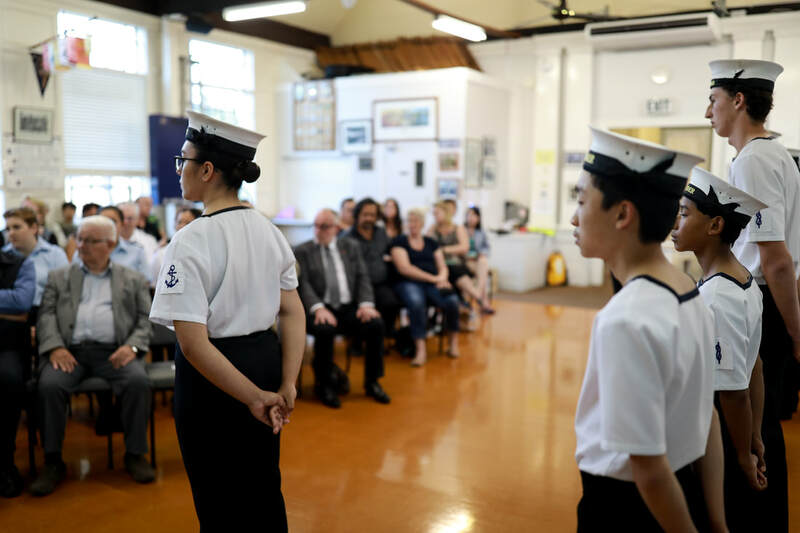 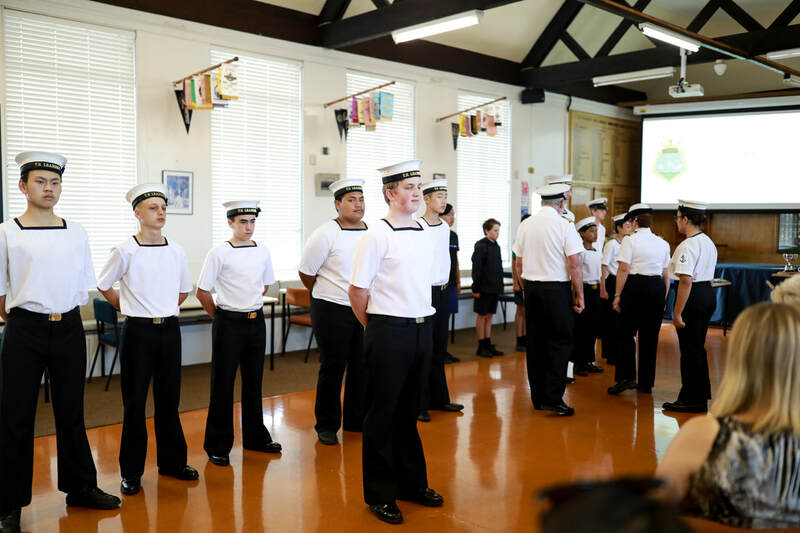 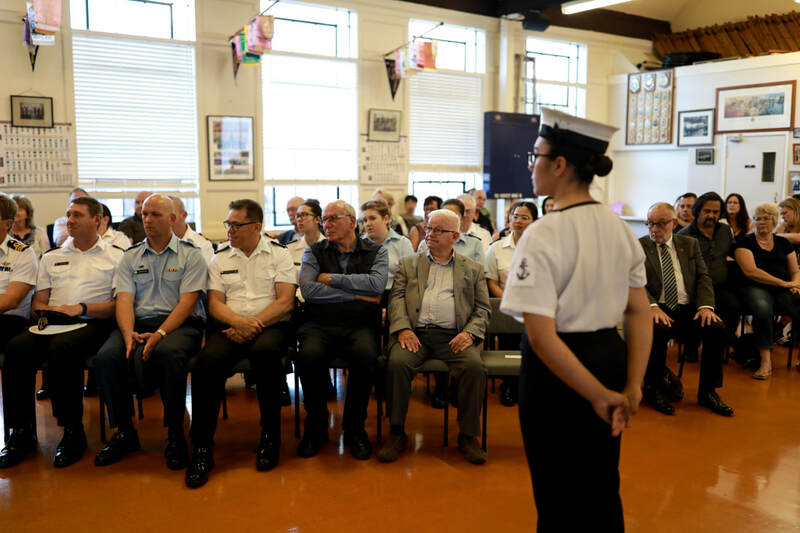 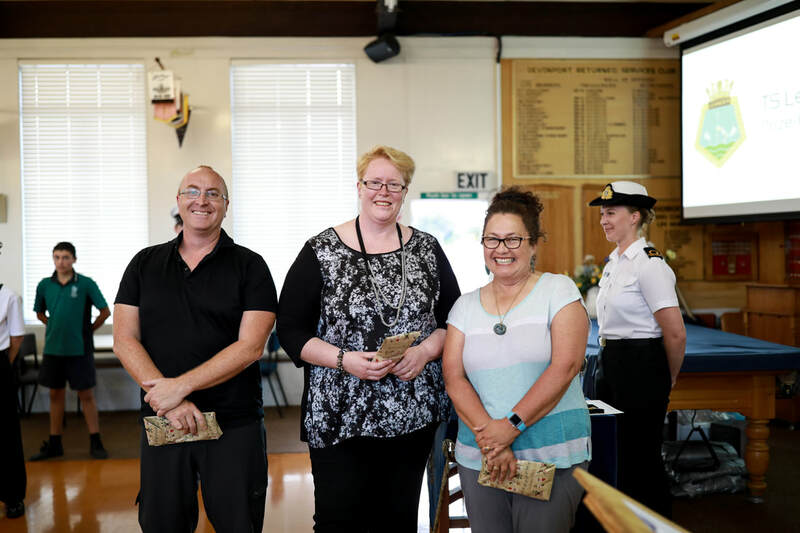 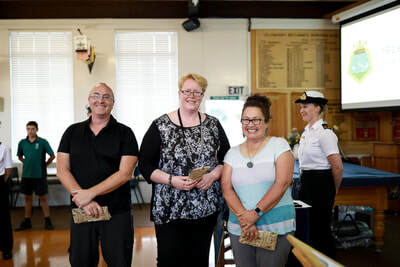 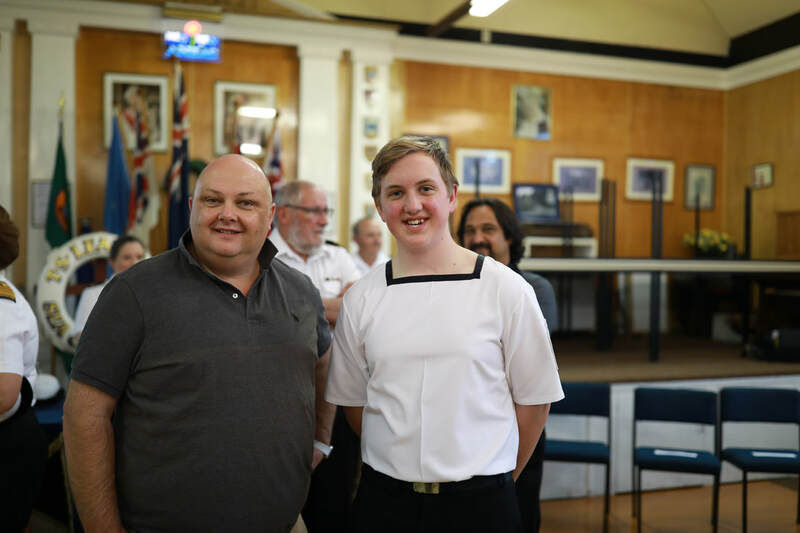 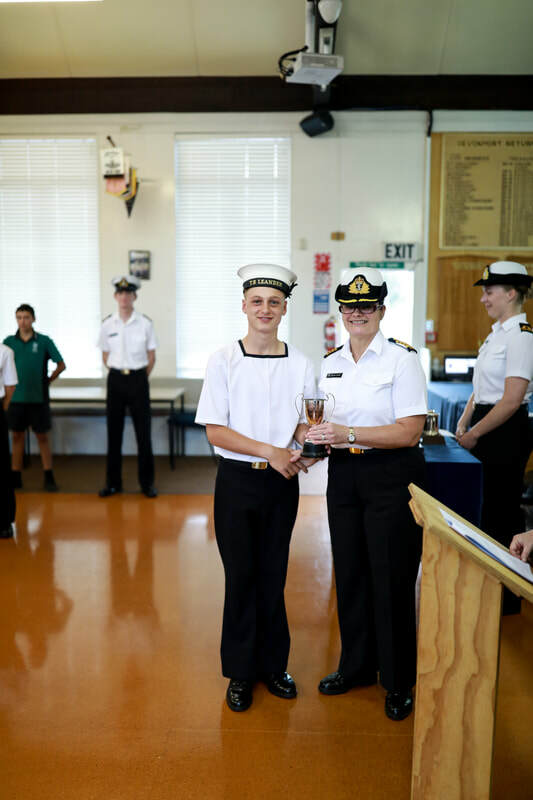 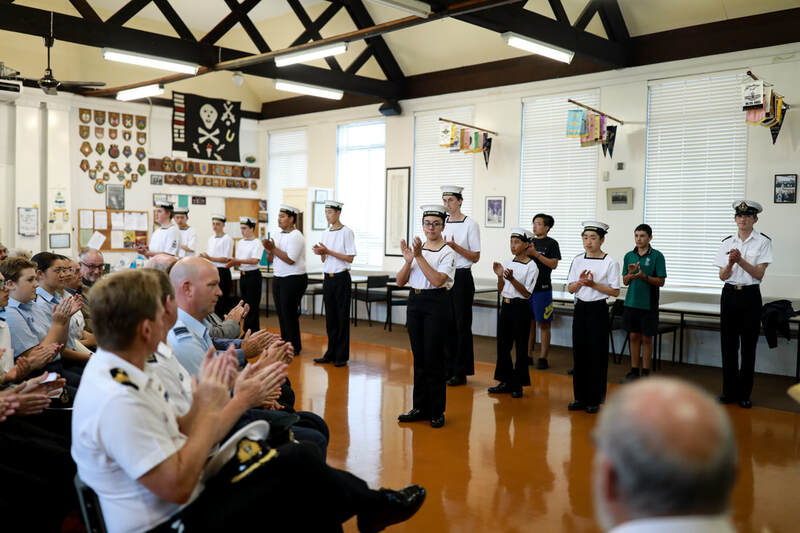 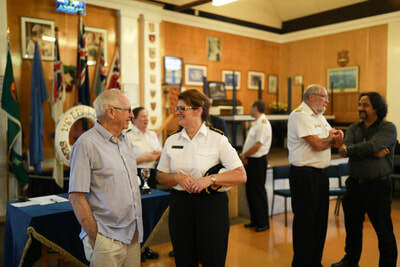 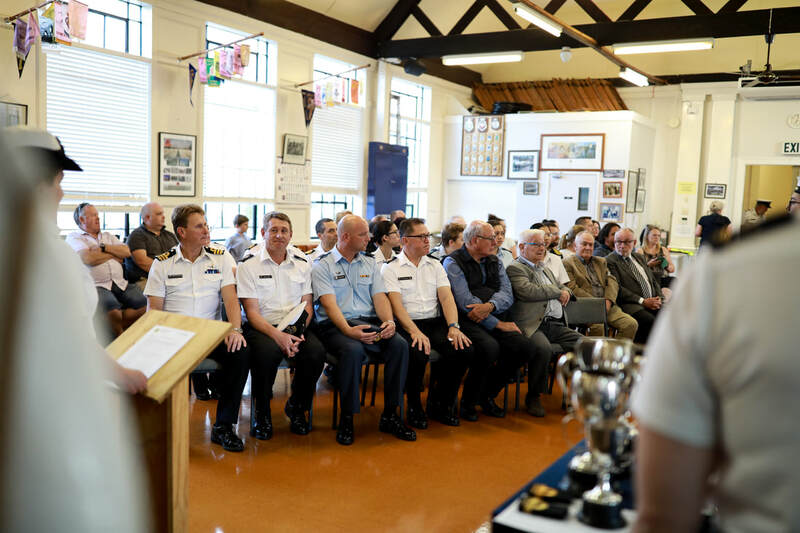 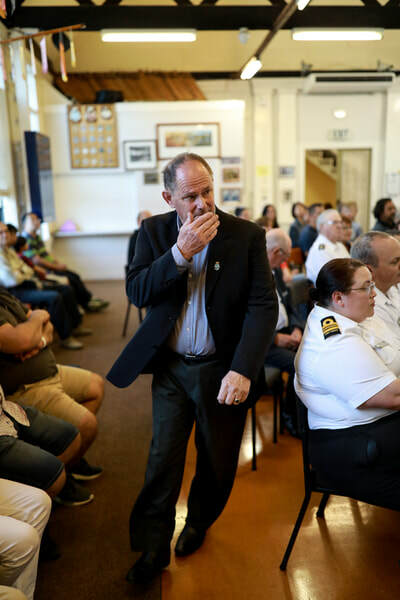 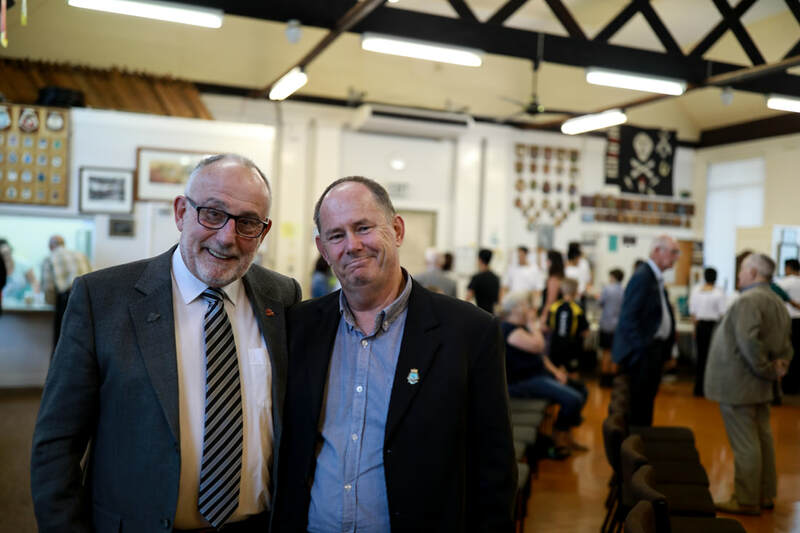 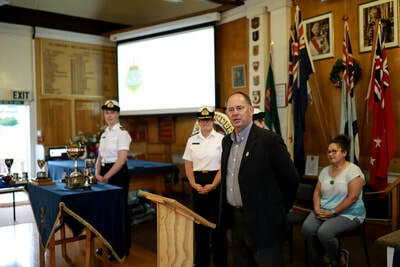 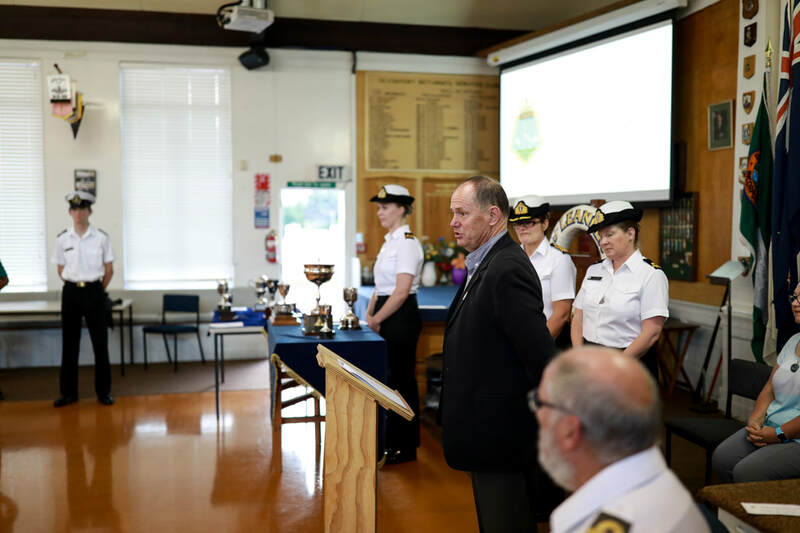 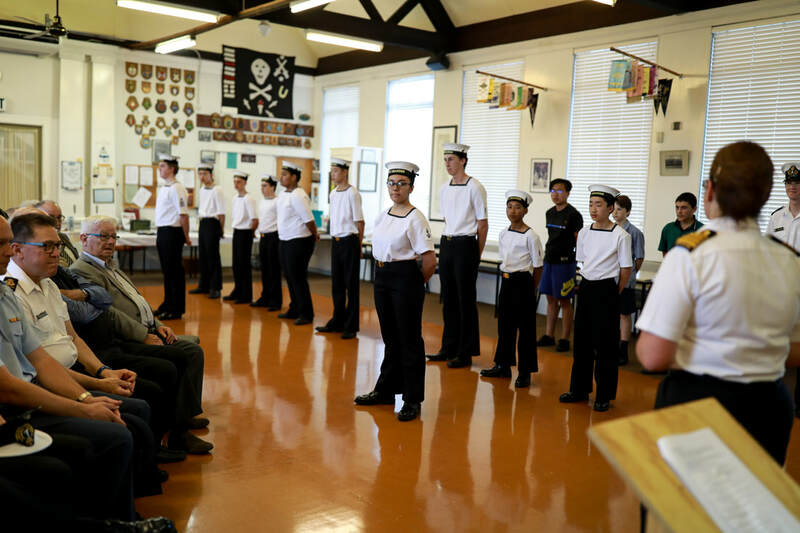 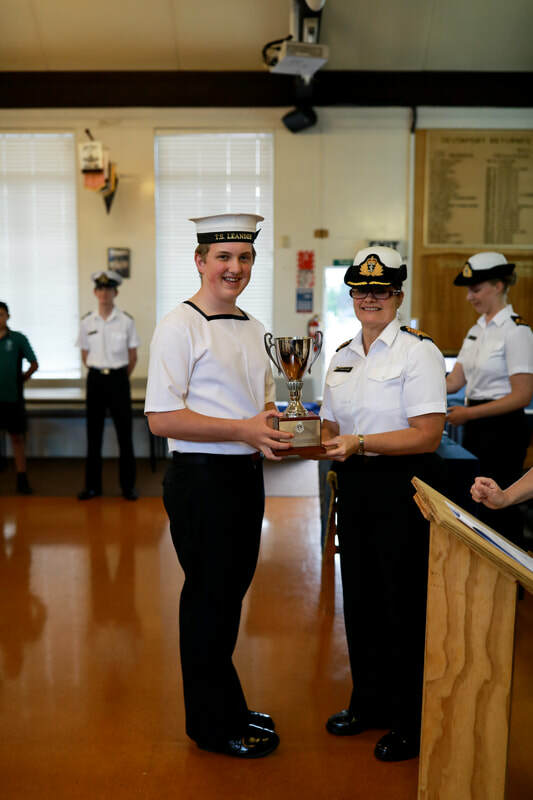 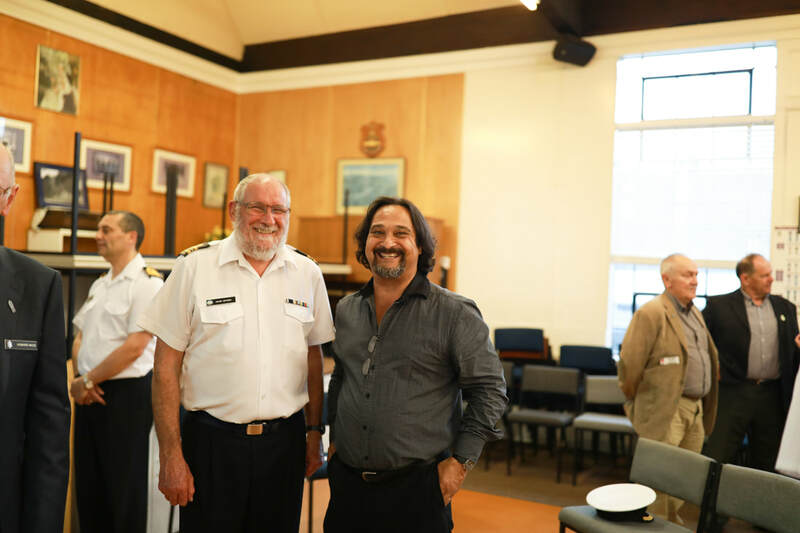 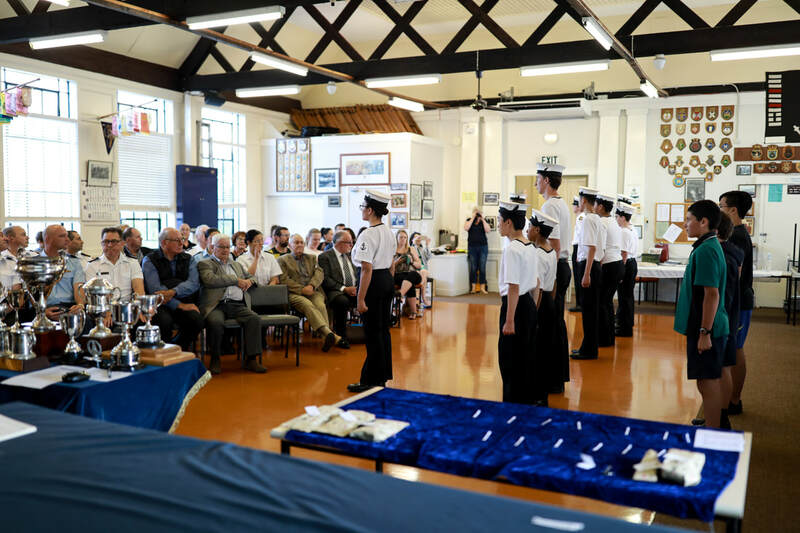 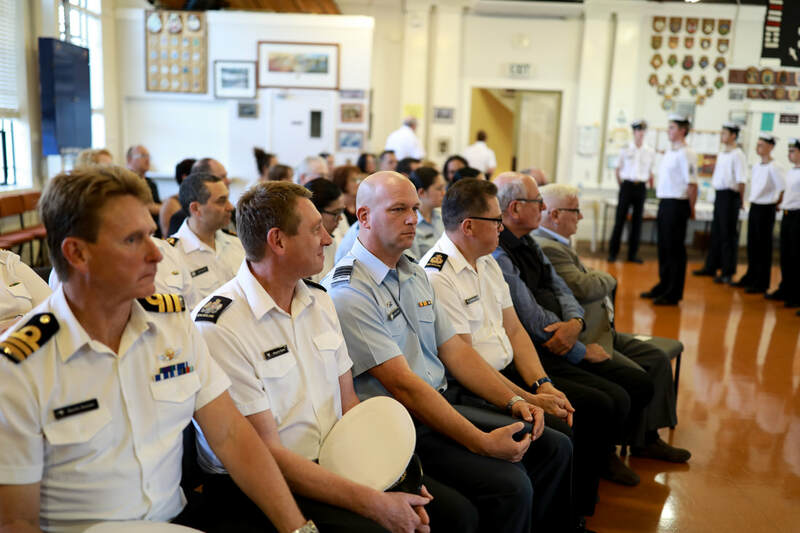 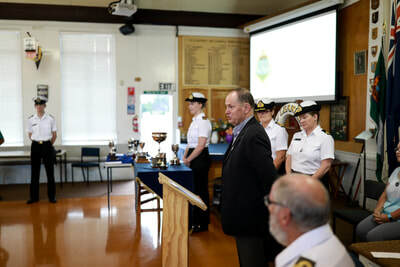 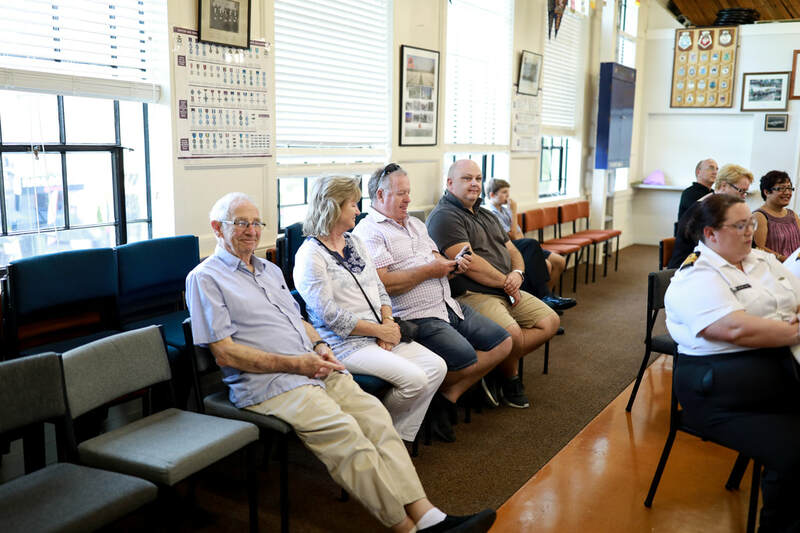 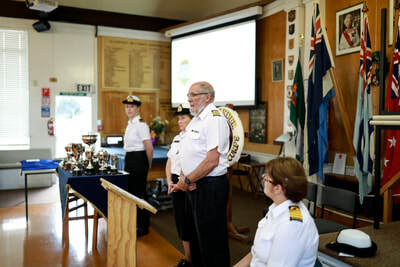 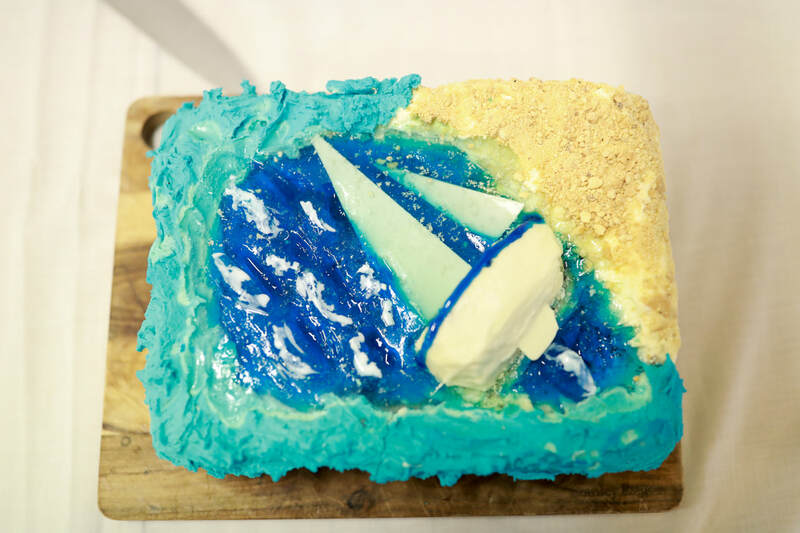 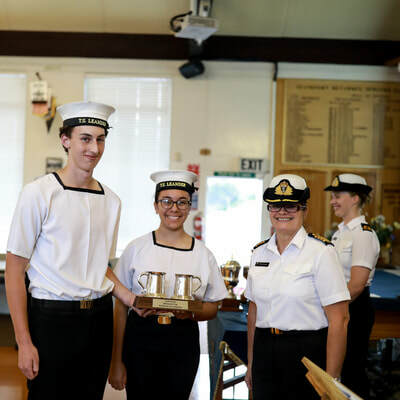 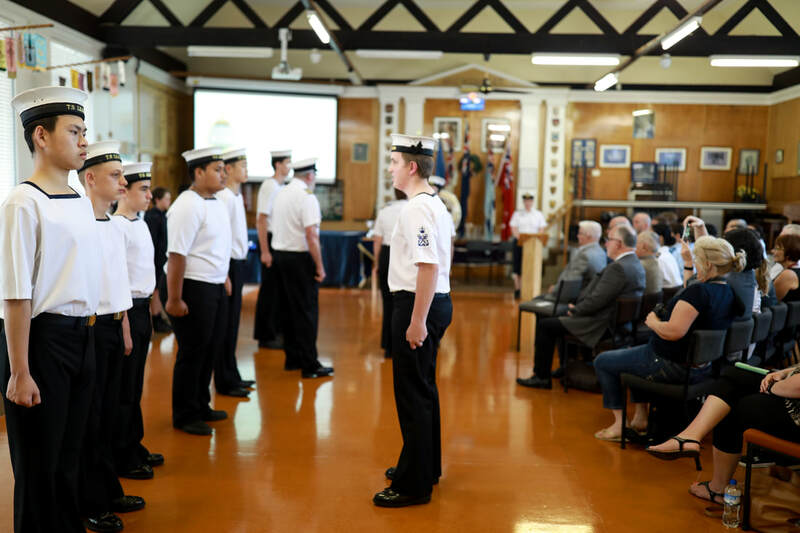 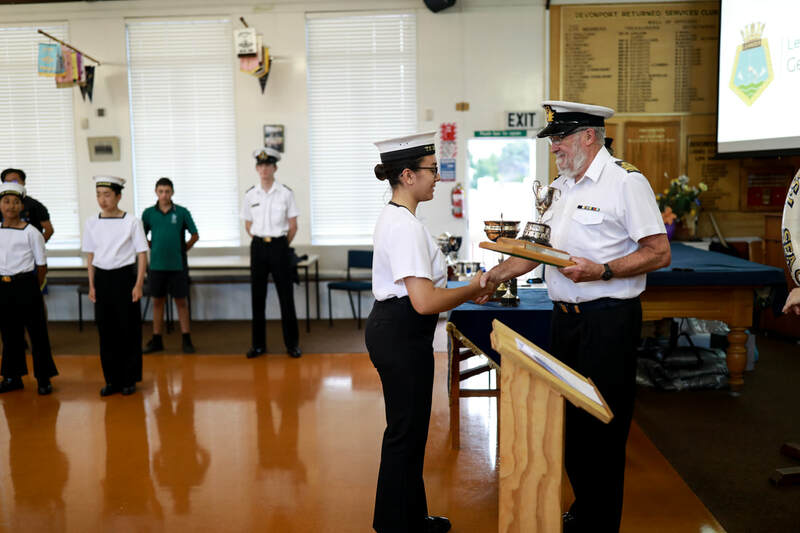 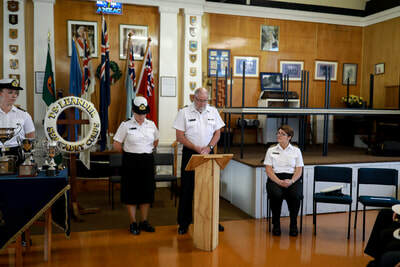 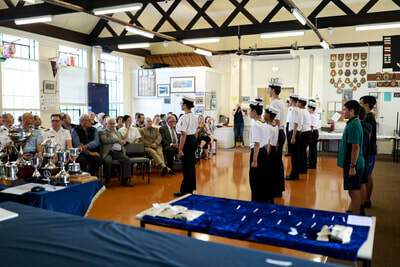 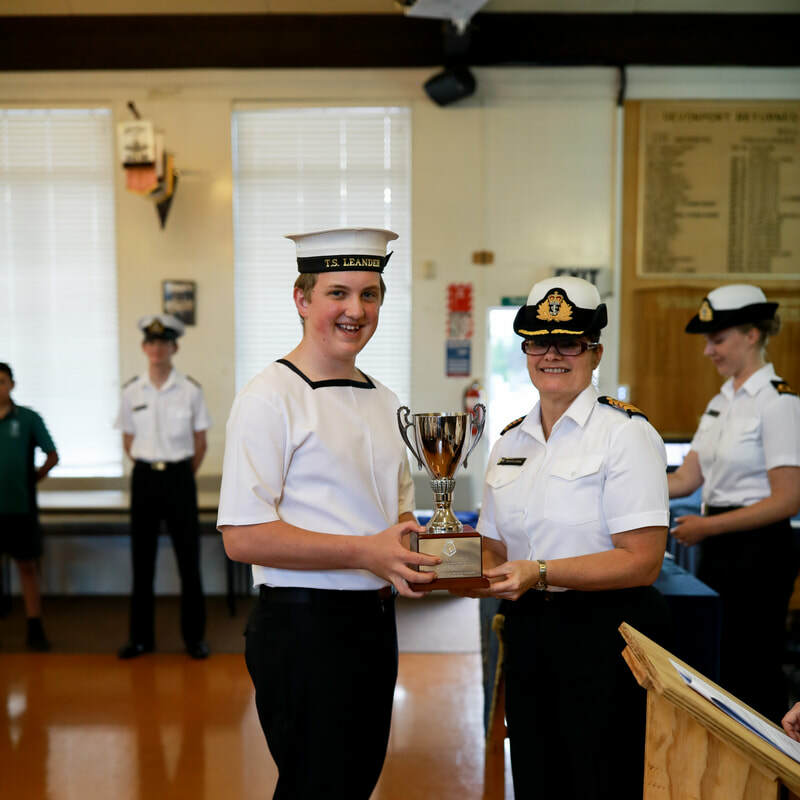 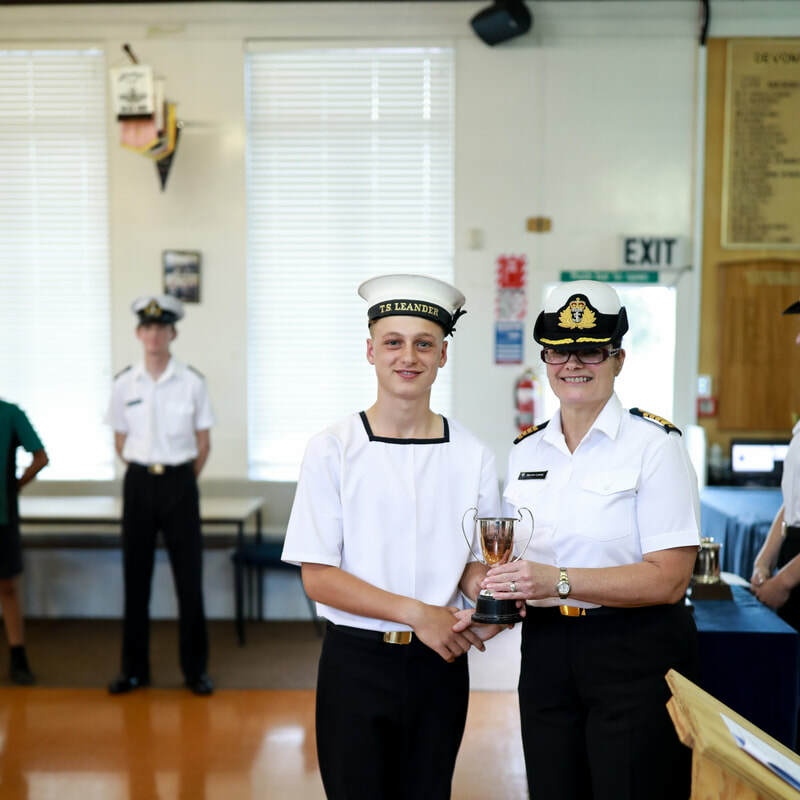 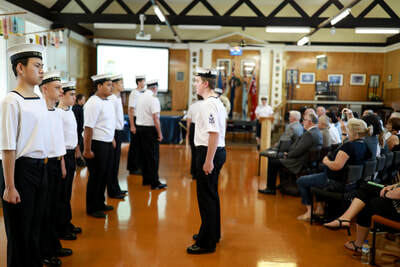 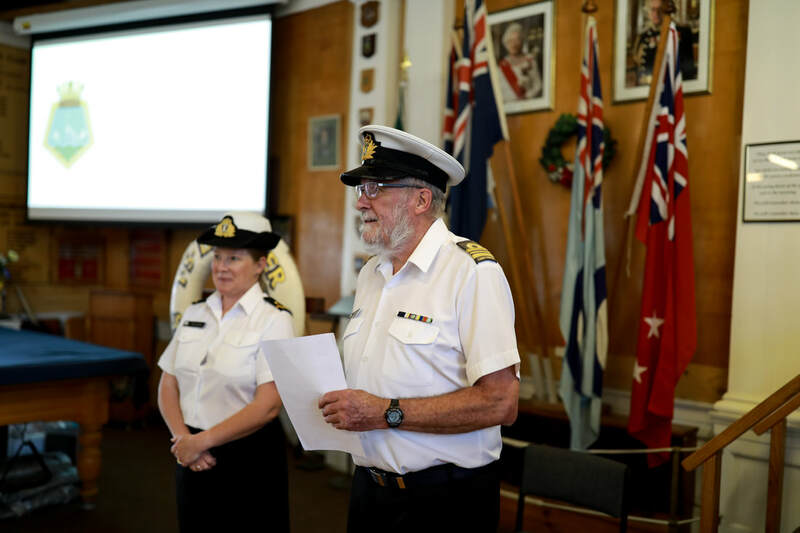 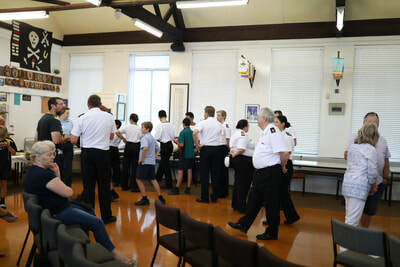 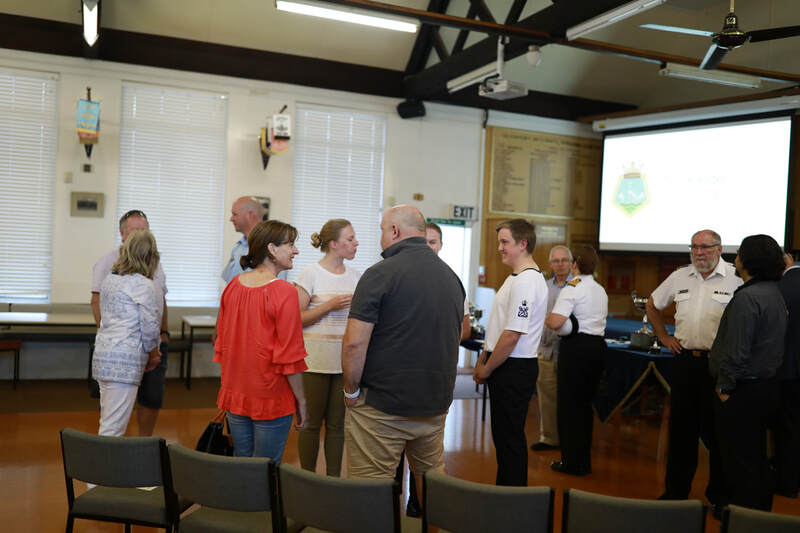 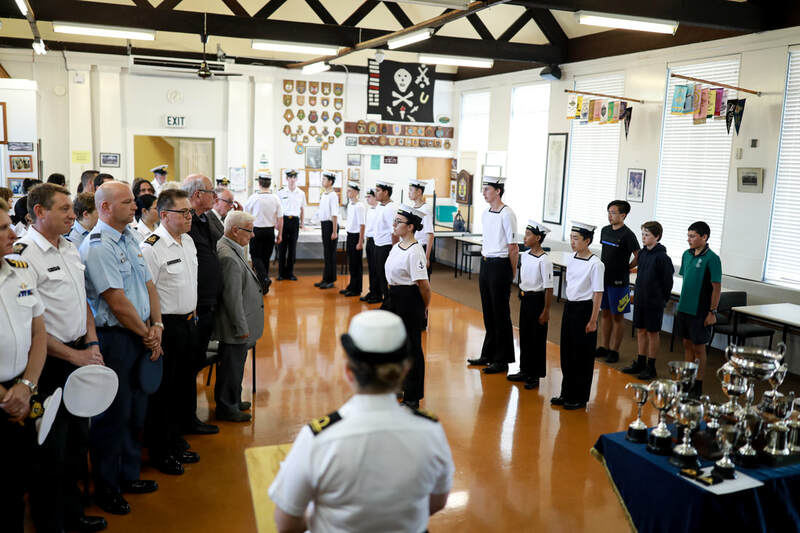 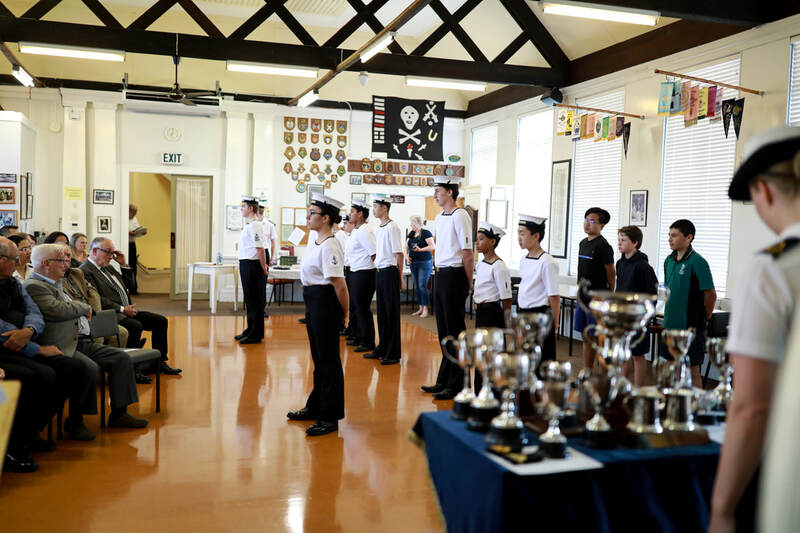 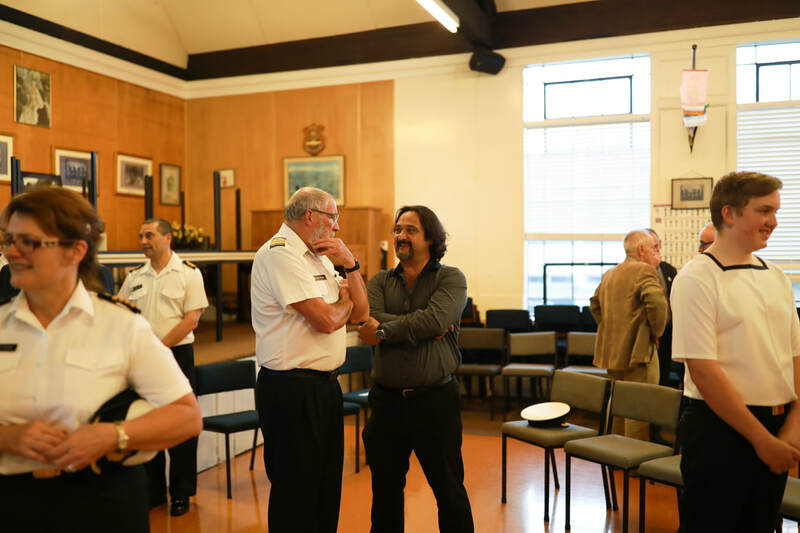 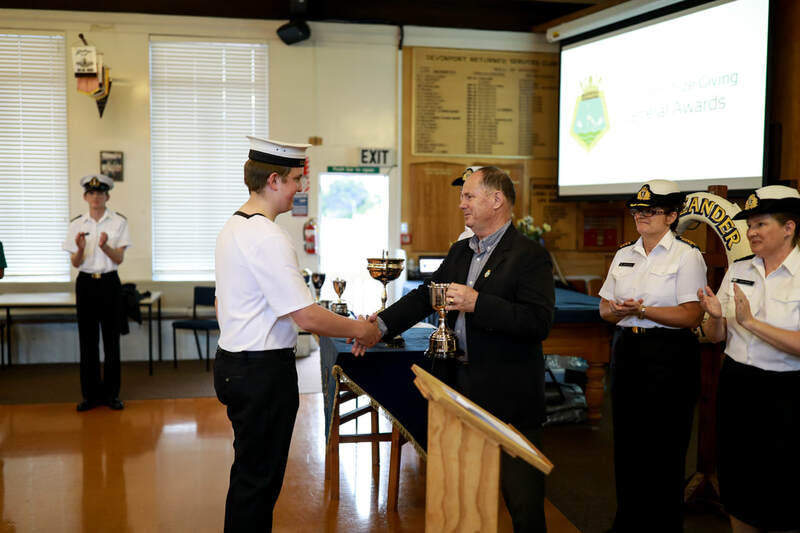 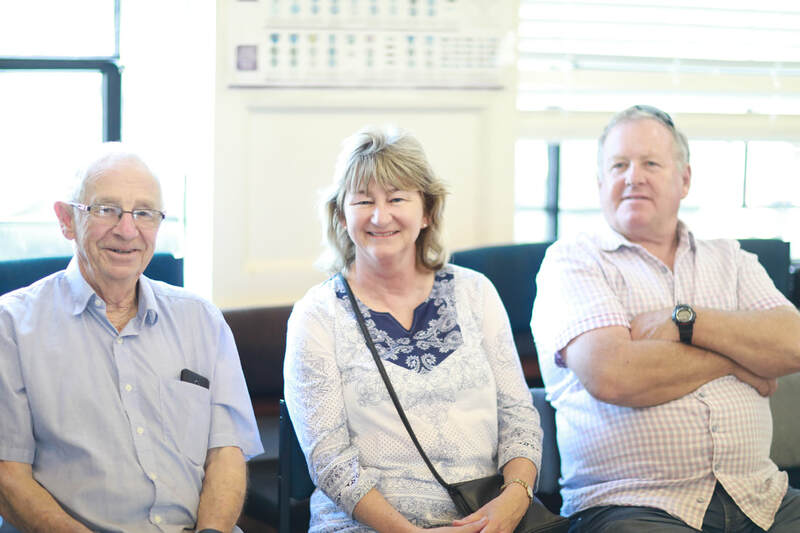 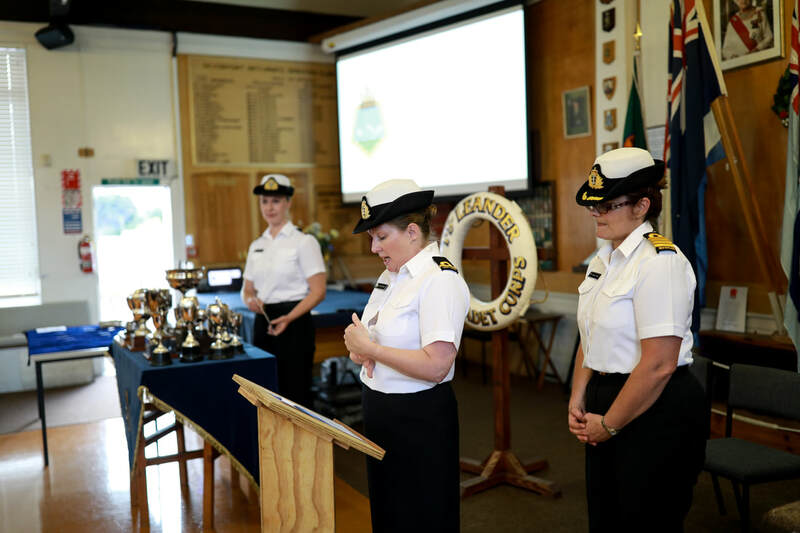 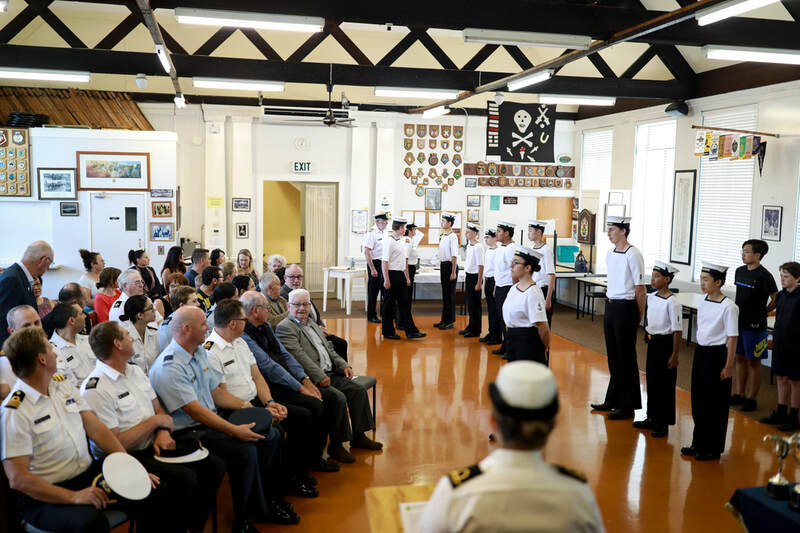 The annual end of year Prize Giving for 2017 was held at the Devonport RSA. 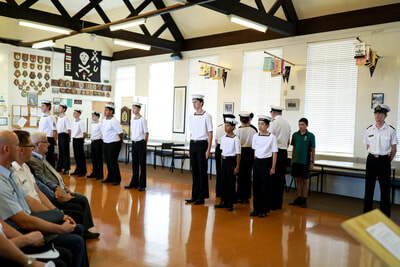 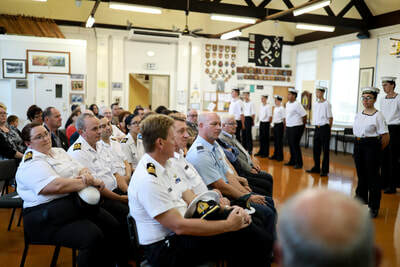 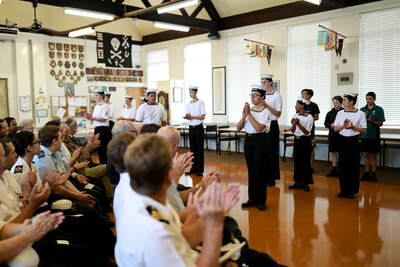 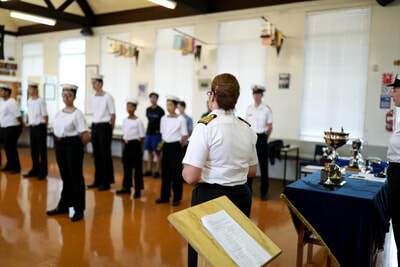 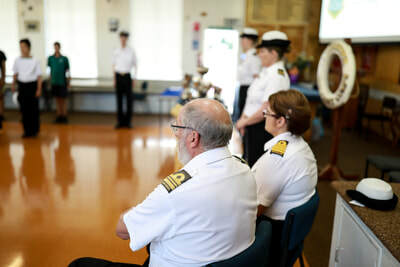 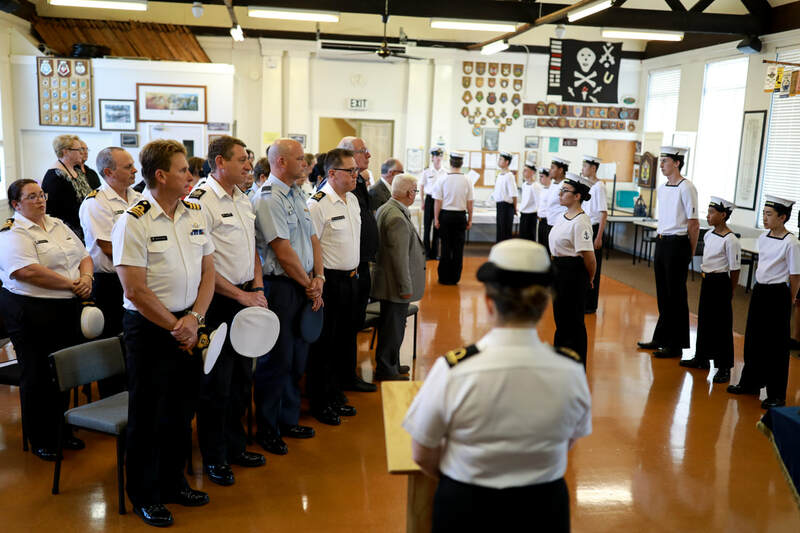 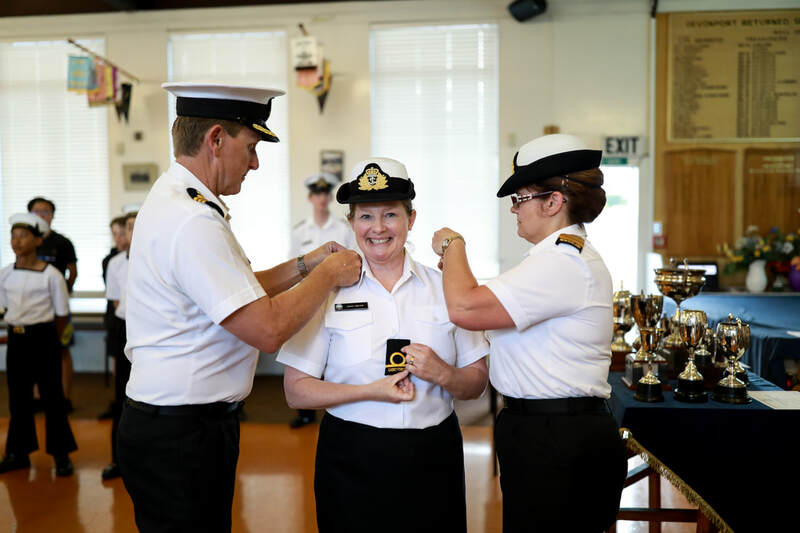 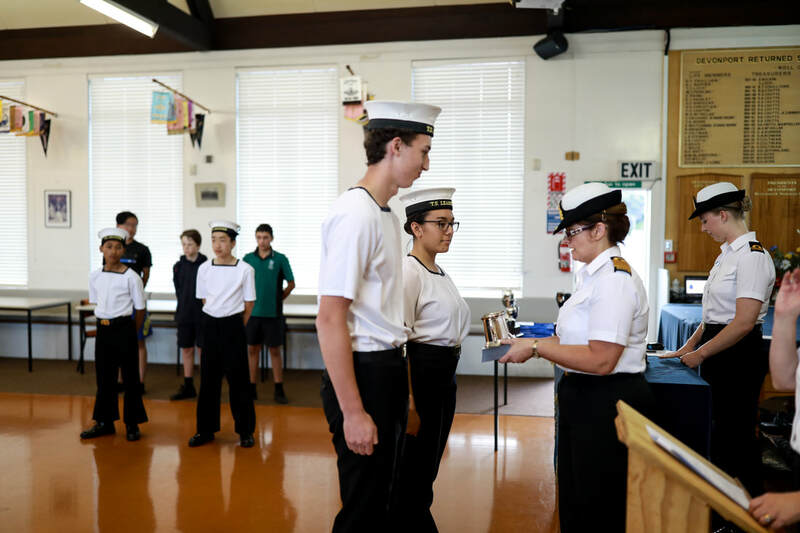 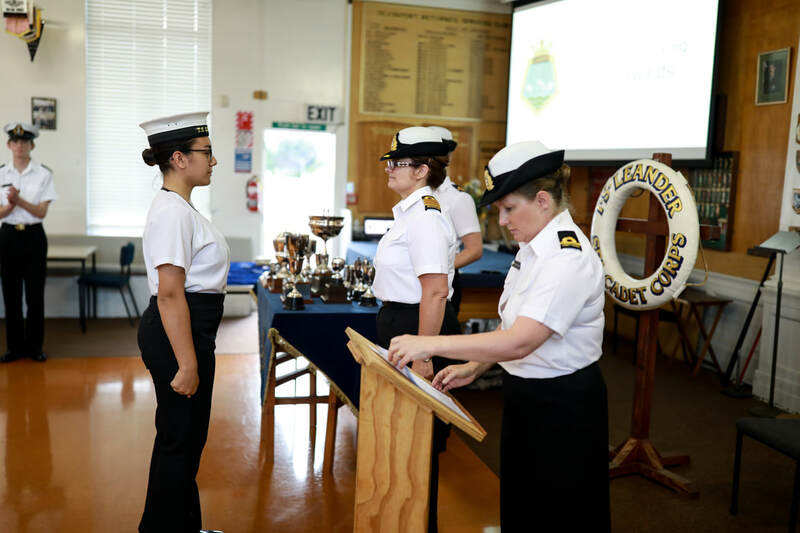 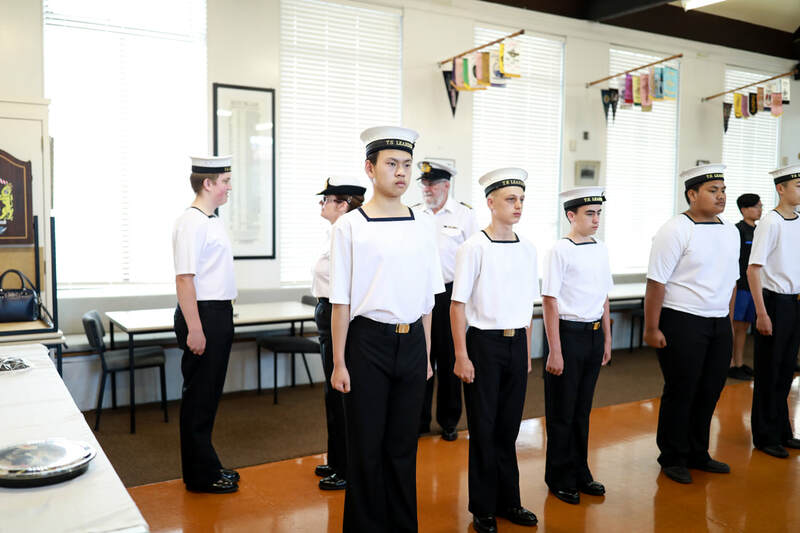 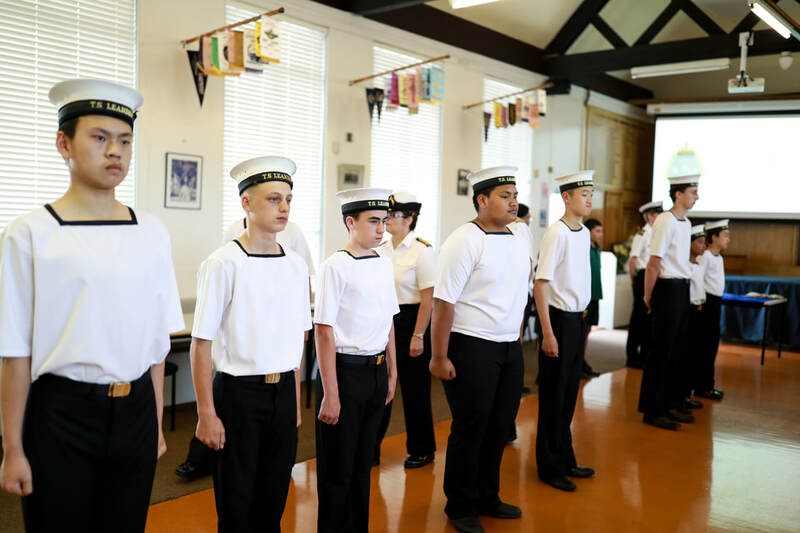 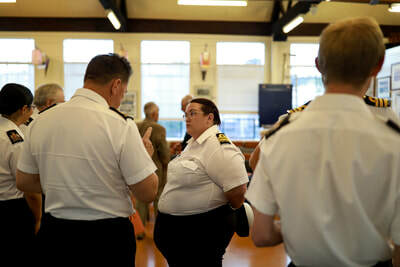 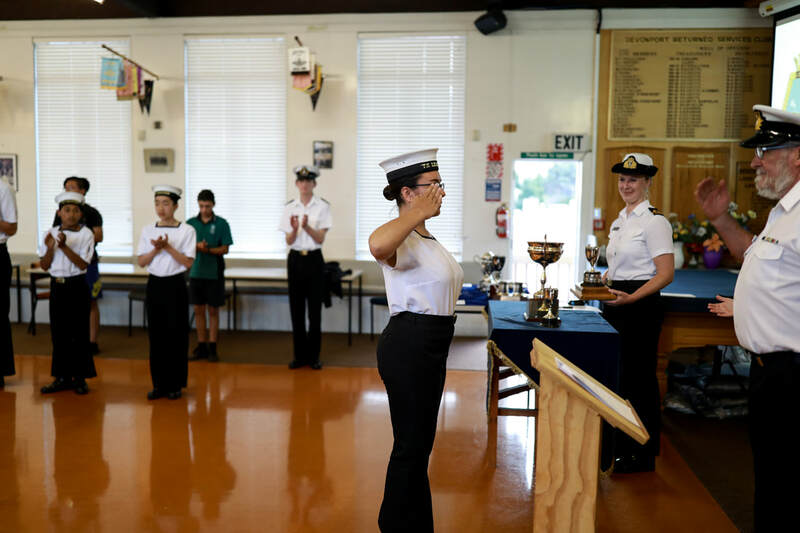 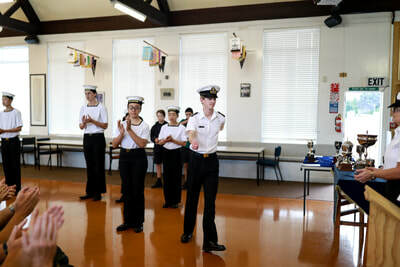 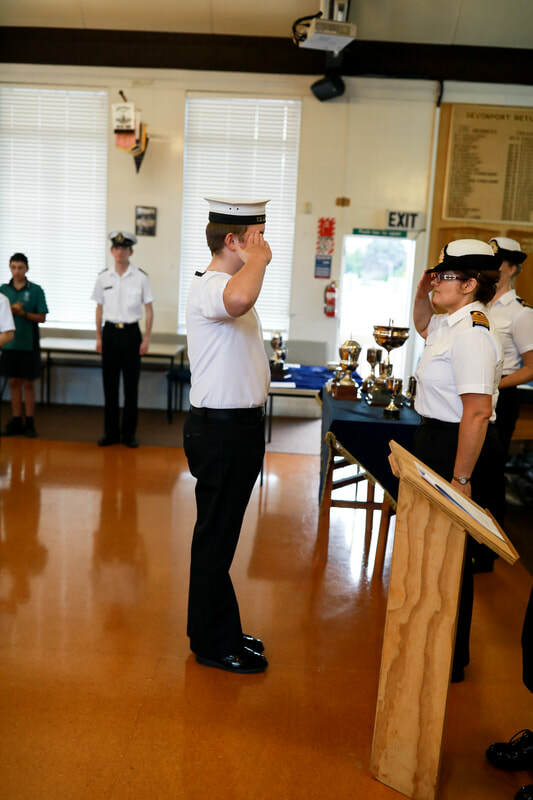 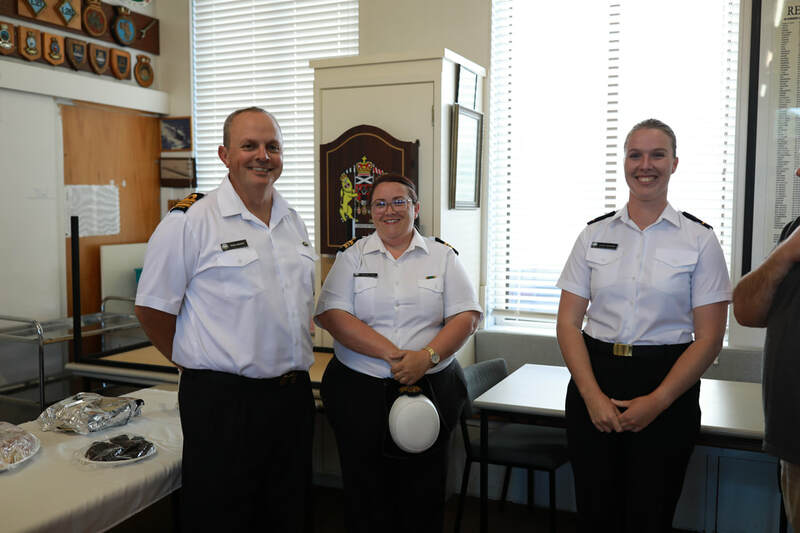 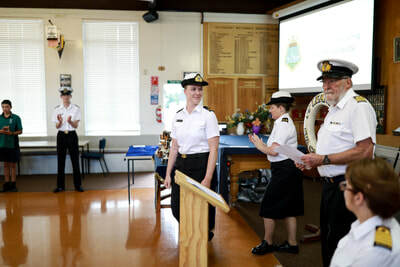 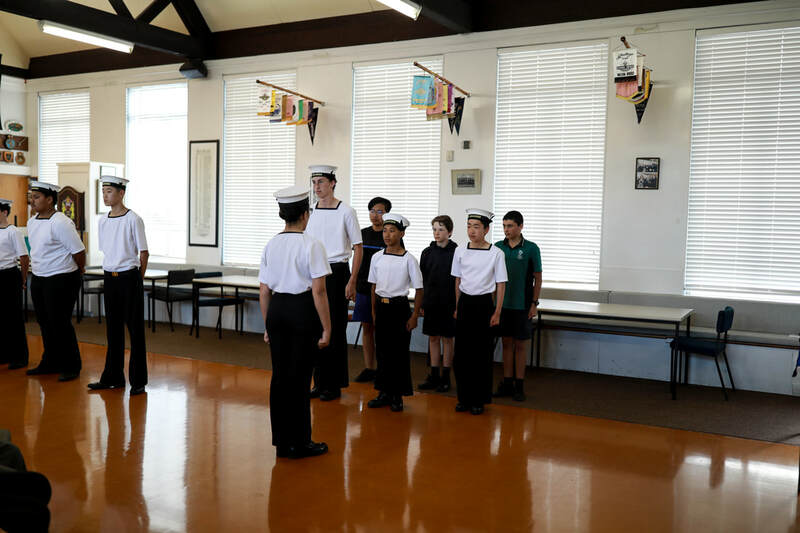 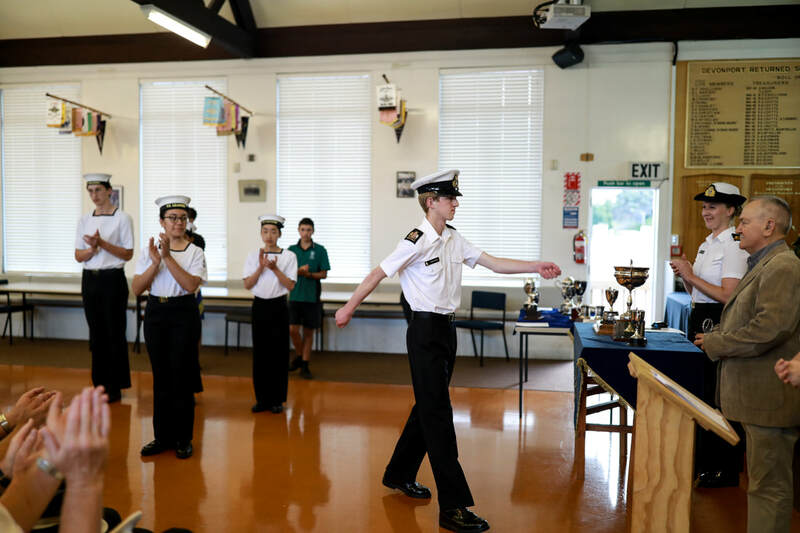 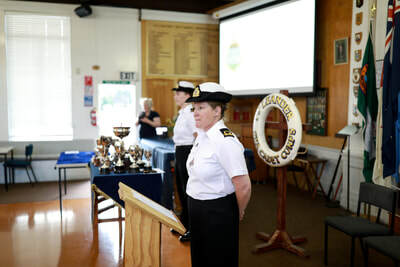 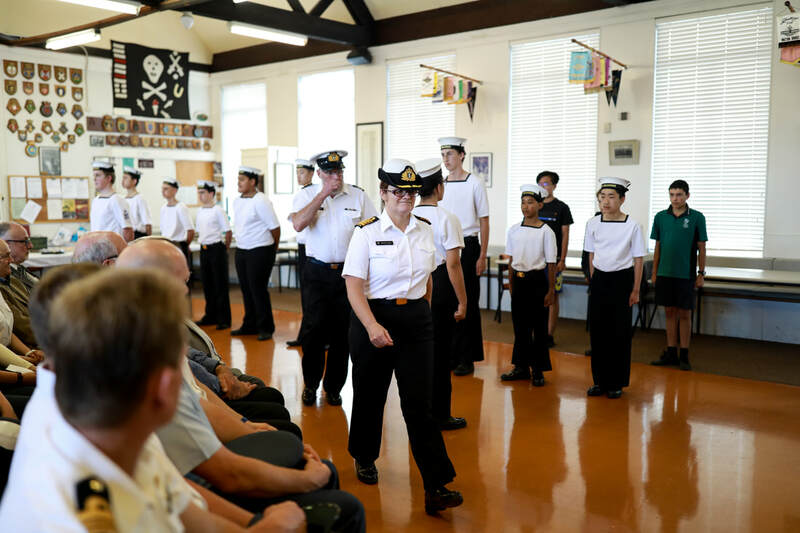 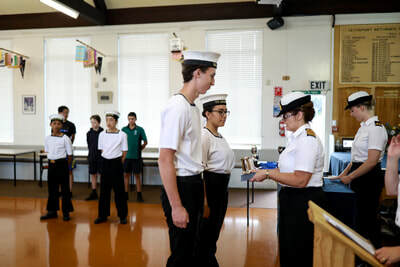 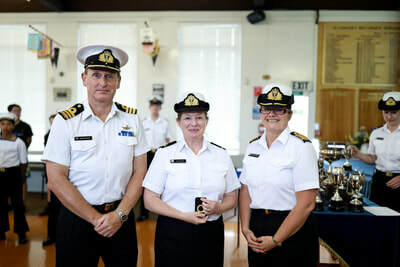 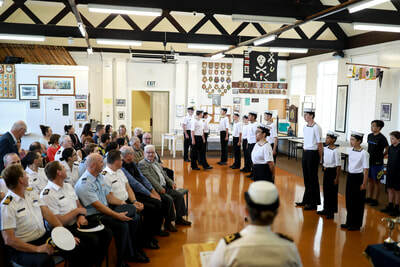 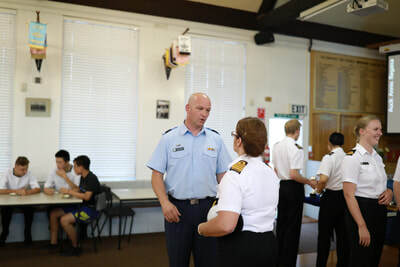 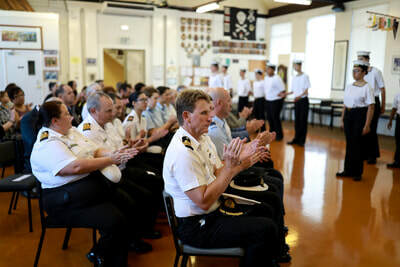 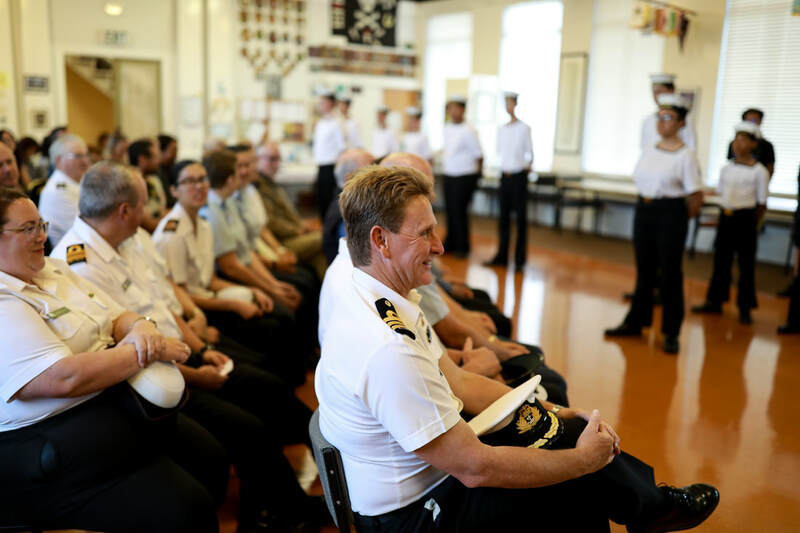 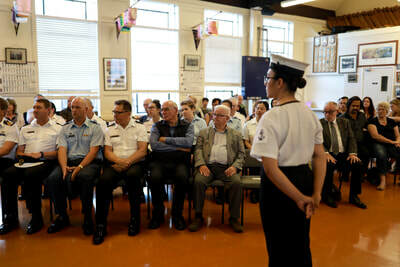 The cadets were inspected by the Reviewing Officer, CAPT Maxine Lawes (RNZN, & TS Leander Patron). 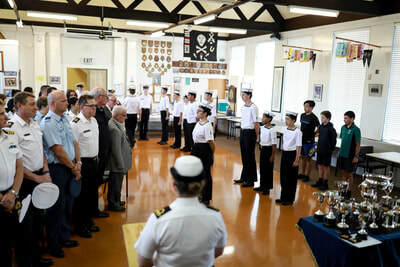 Following the parade cadets were joined by a number of guests, including the Commanding Officer of HMNZS Endeavour, the Warrant Officer of the Navy, Assistant Commandant of the NZCF, Commanding Officers & staff from cadet units, fromer TS Leander personnel, members of the RSA & Navy League, and families of the cadets. 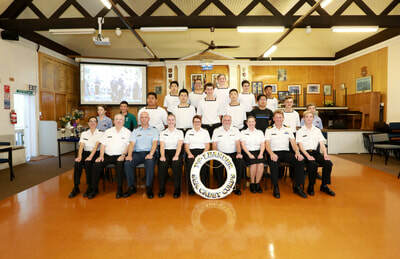 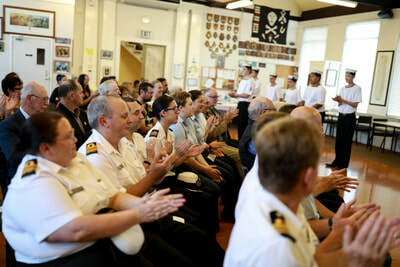 Bravo Zulu to all those who were promoted or received awards and thank you to all those who attended. 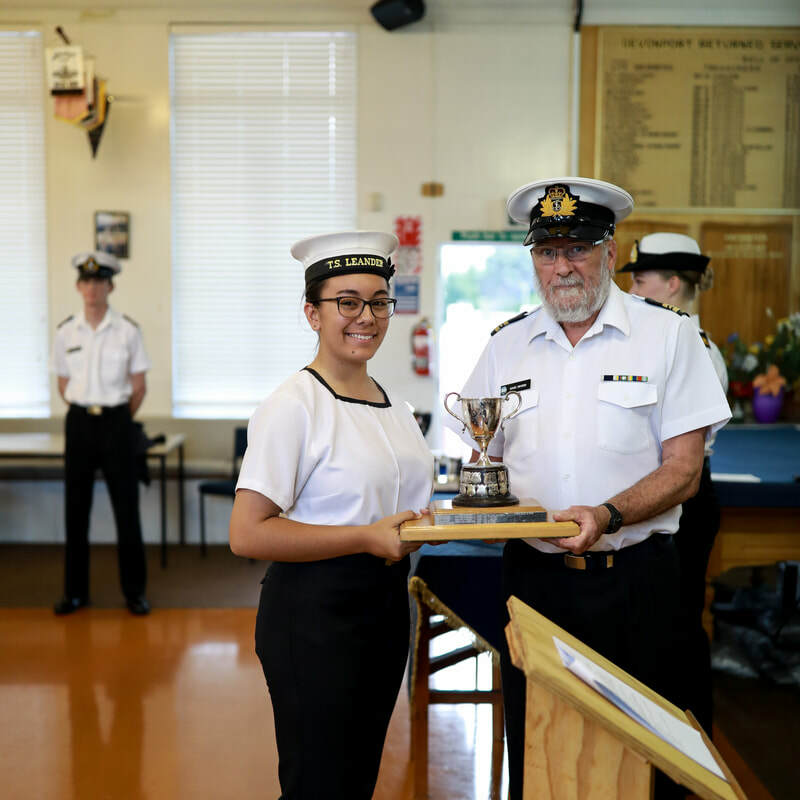 ACDT Aroa gains the Day Skipper Qualification. ACDT Sinnes receives the Leander Cup. LCDT Gair-Ah Siu receives the Dorothy Greig Cup. 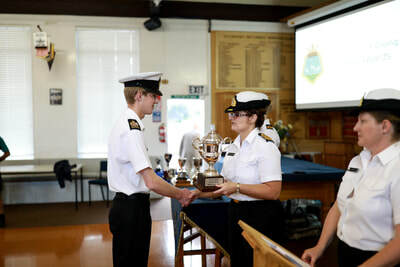 OCDT Kim recieves the Lewis Cup. 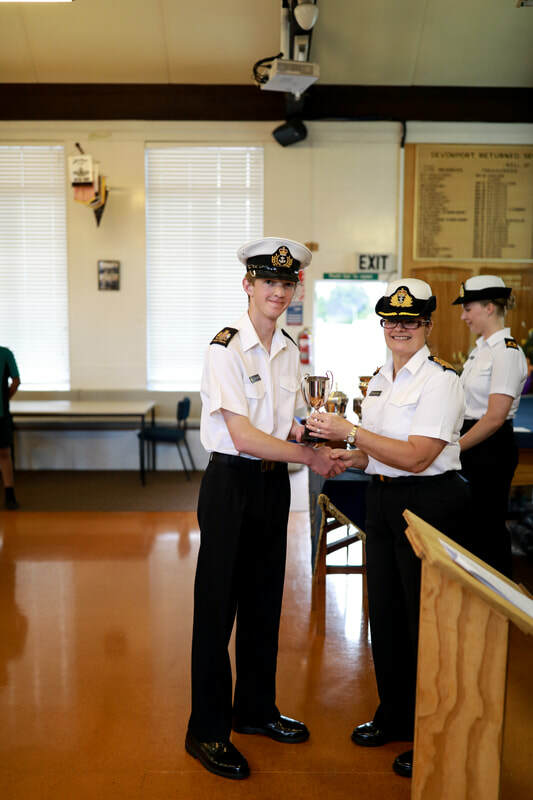 OCDT Pieters receives the Torpedo Bay Cup. 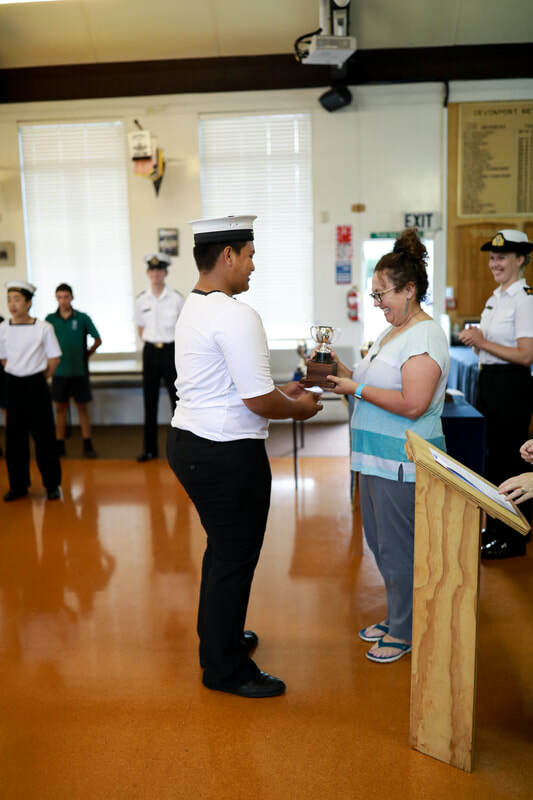 OCDT Kuluka receives the TS Leander Parents Committee Cup. 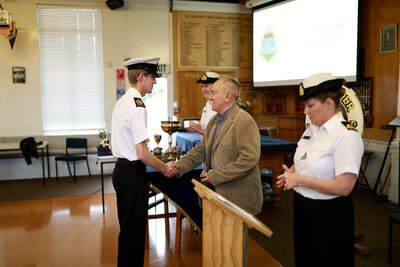 POCDT Porter receives the Leon Harvey Cup. 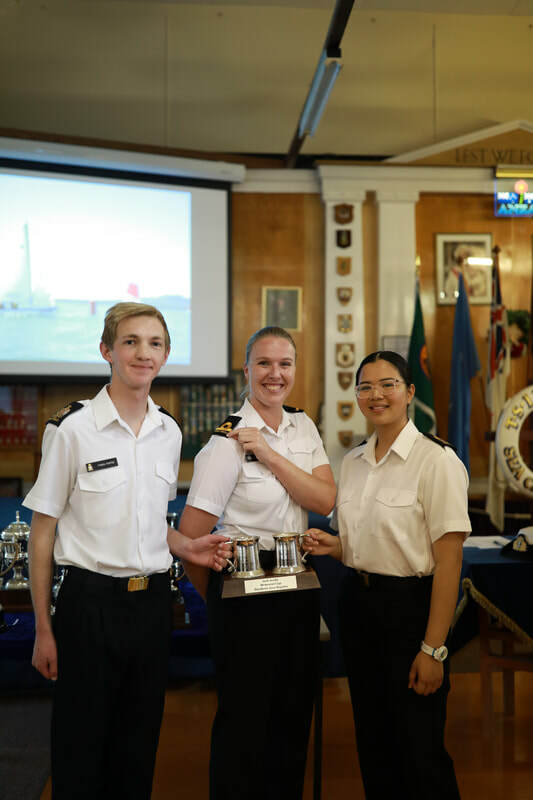 ACDT Murahidy & LCDT Gair-Ah Siu receive the Jack Scelly Memorial Cup. 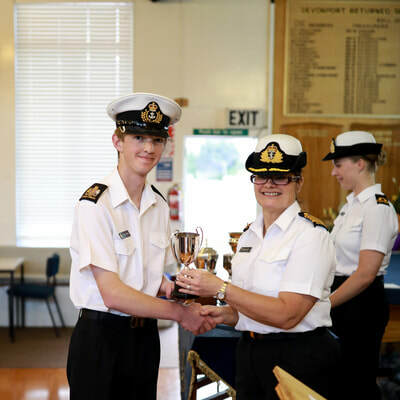 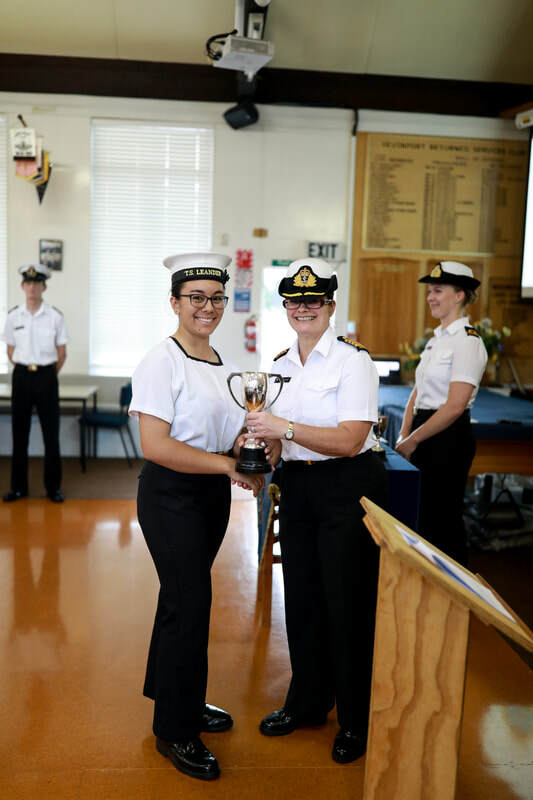 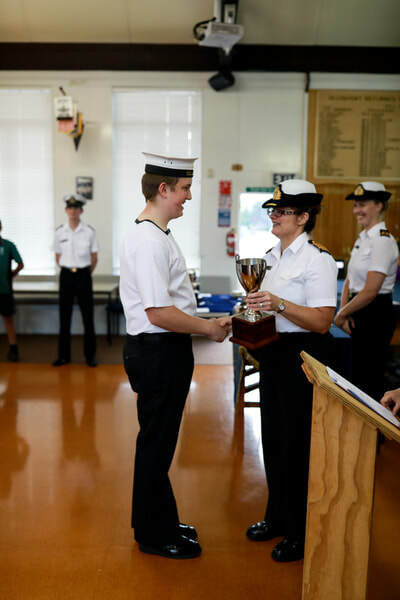 WOCDT Porter receives the Seamanship Cup. WOCDT Porter receives the TS Leander Sir Peter Blake Cup. 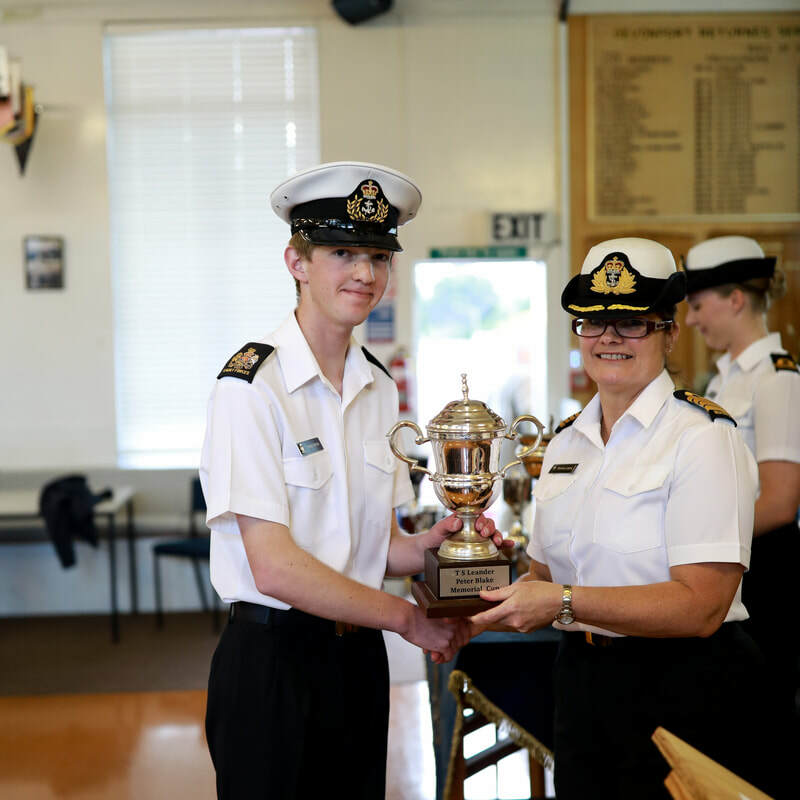 WOCDT Porter receives the Simpson Henderson Trophy. 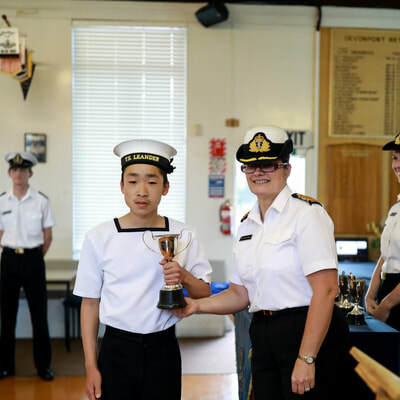 LCDT Gair-Ah Siu receives the Irene Wilson Cup. 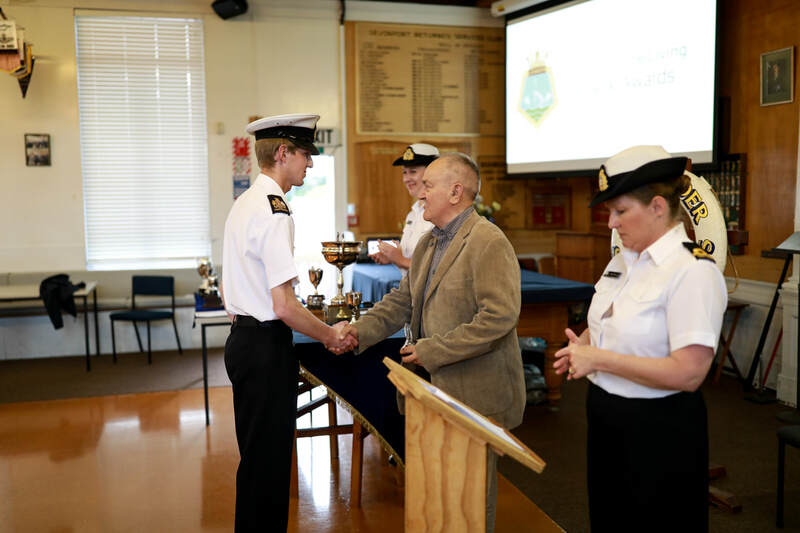 Bravo Zulu to all prize winners! 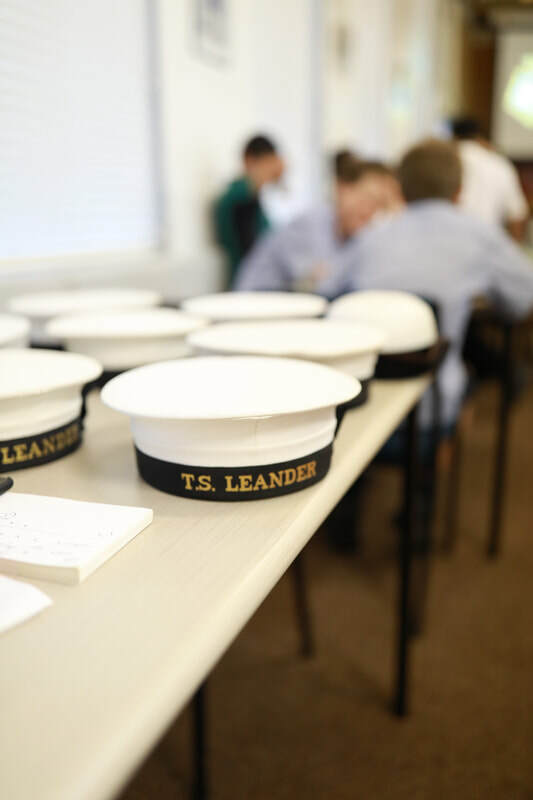 This year one of TS Leanders' patron, Desmond (Des) William Robinson Price, passed away. 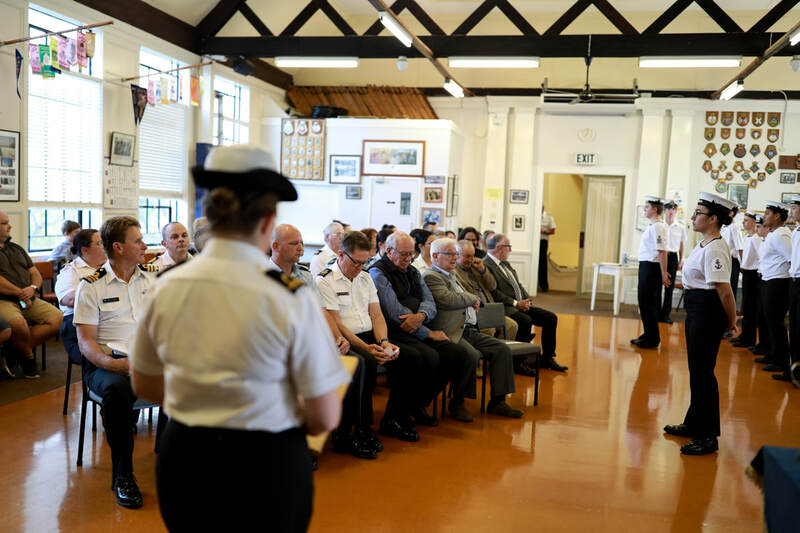 Represtitives of the ships company were honoured to attend his funeral at Devonport Naval Base’s St Christopher Chapel in October. 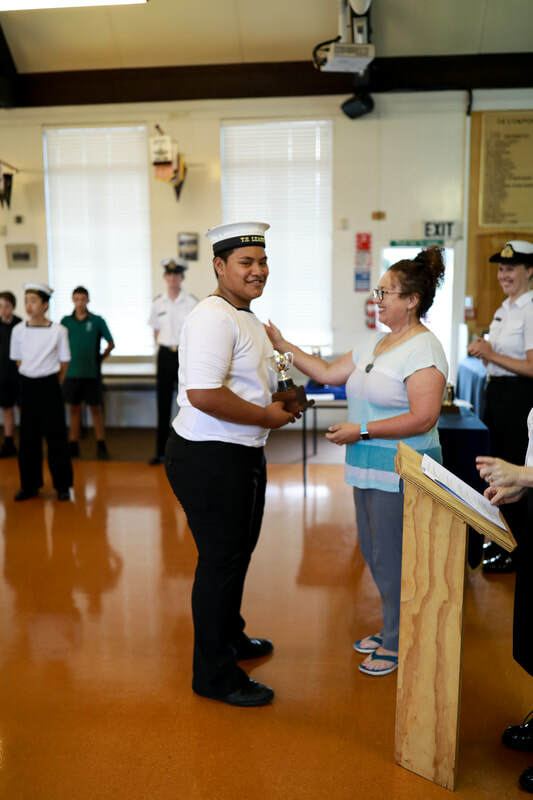 At 18 years of age, Des Price applied to join the Navy and was accepted as a 2nd Class Stoker, joining HMNZS PHILOMEL at Devonport for training in October 1938 and signing on for 12 years. He joined the ship’s company of LEANDER in March 1939 and was at sea when WWII began. 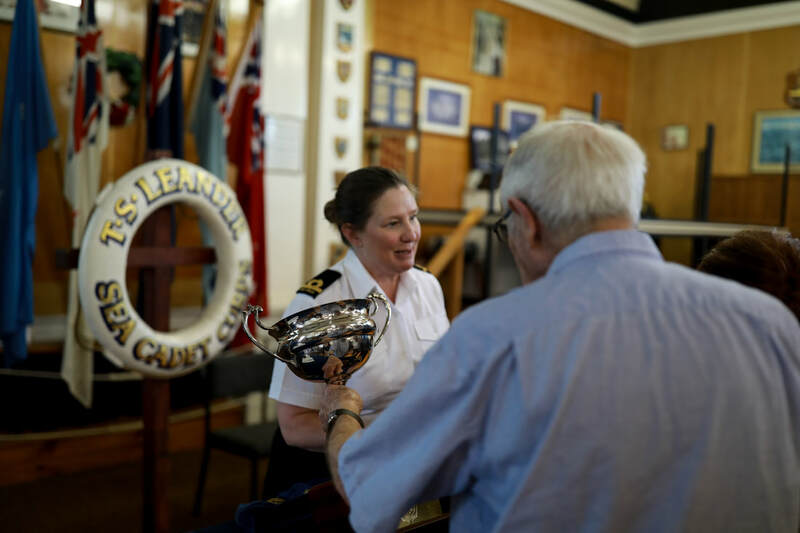 Des was the last surviving member of light cruiser HMNZS LEANDER crew on board during active service when it was torpedoed. He left the Navy in 1958 to become a teacher – where he spent 21 years, retiring in 1982. In retirement he had time for his other interests, including gardening, fishing, mechanics, and reading. 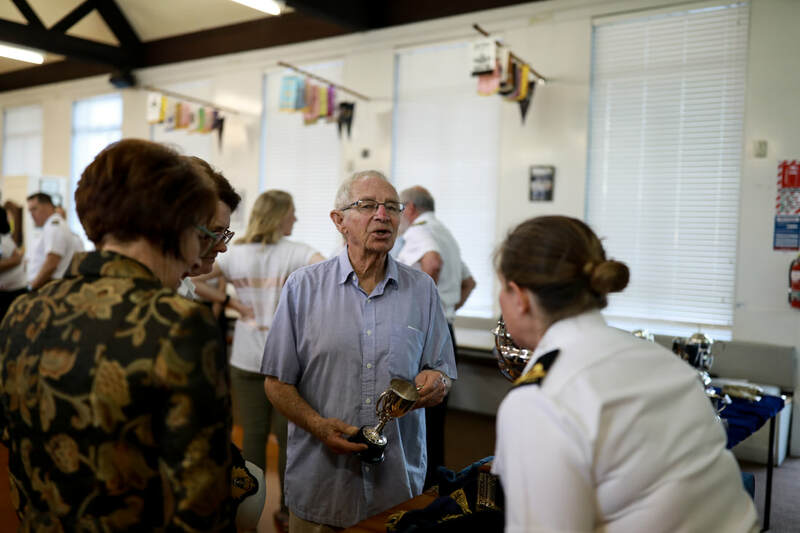 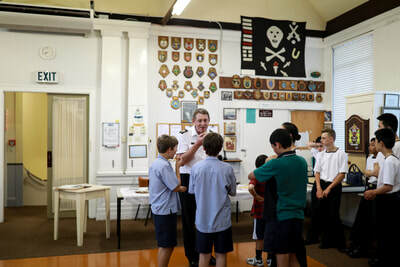 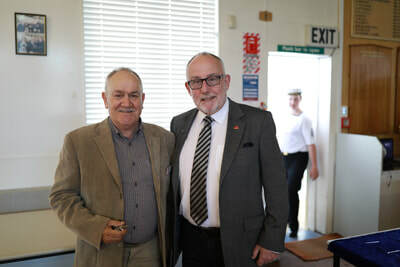 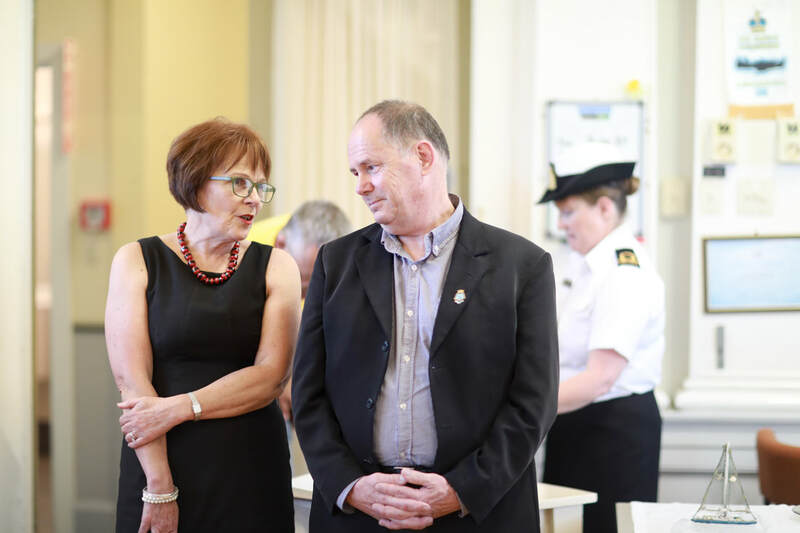 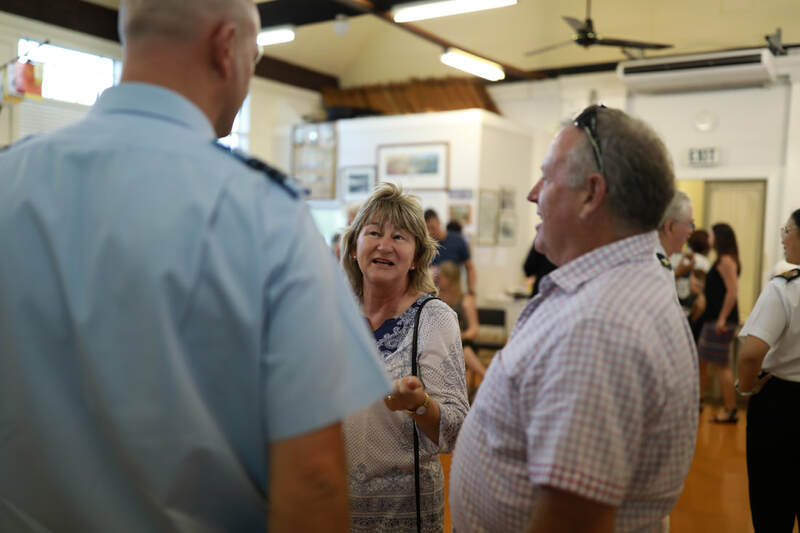 The Leander Association, the Cruiser Association, the Submariners Association and the RSA were a big part of his life, and he enjoyed the Navy Museum, where he was Patron of TS LEANDER sea cadets and had an active interest in the modern Navy. We are very grateful for the countless times Des gave up his time to visit the unit and share his stories. 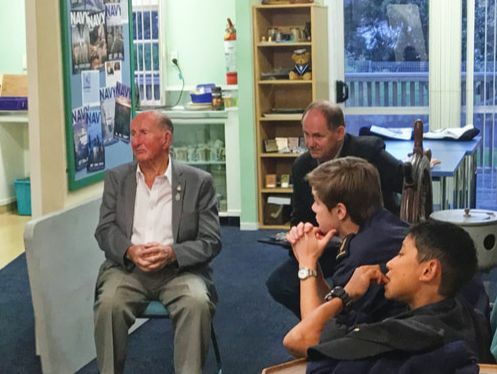 May his stories continue to be told forever. Grant Price presented the NZD 1640 Memorial Cup to TS Leander in the memory of his father, Des Price. 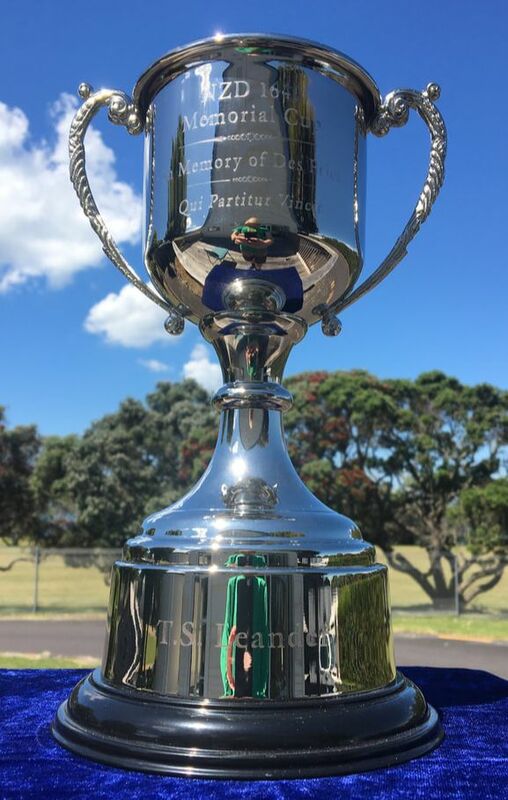 The name of the cup 'NZD 1640' comes from the service number of Des. 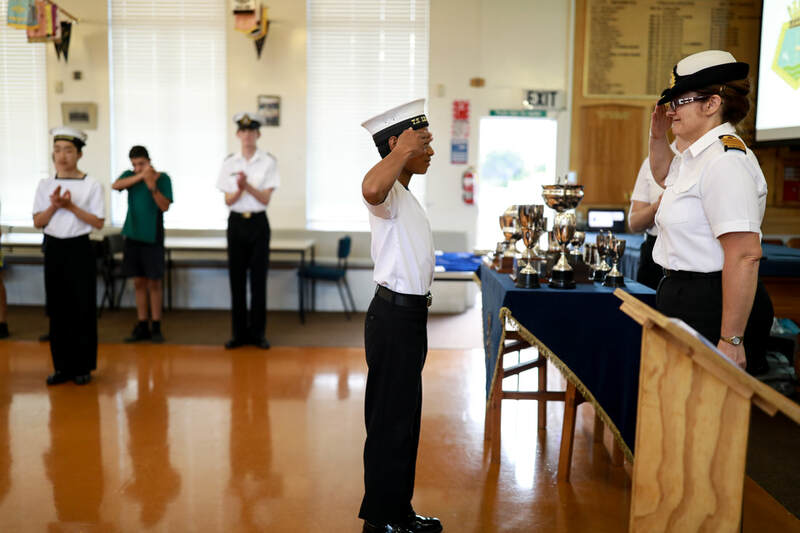 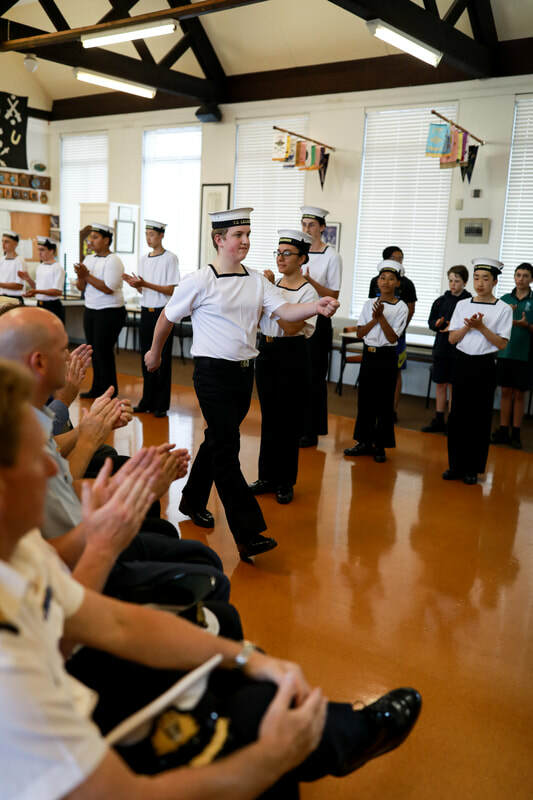 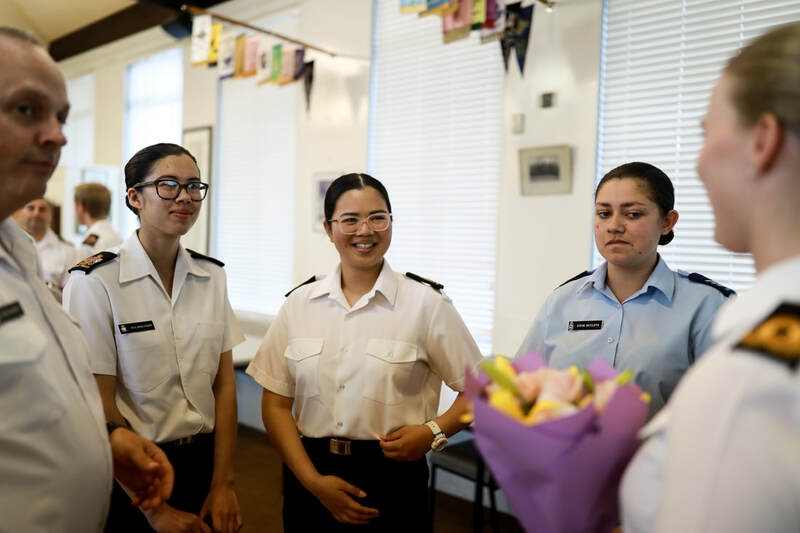 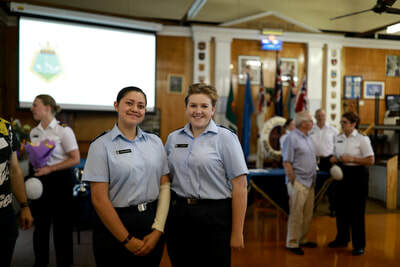 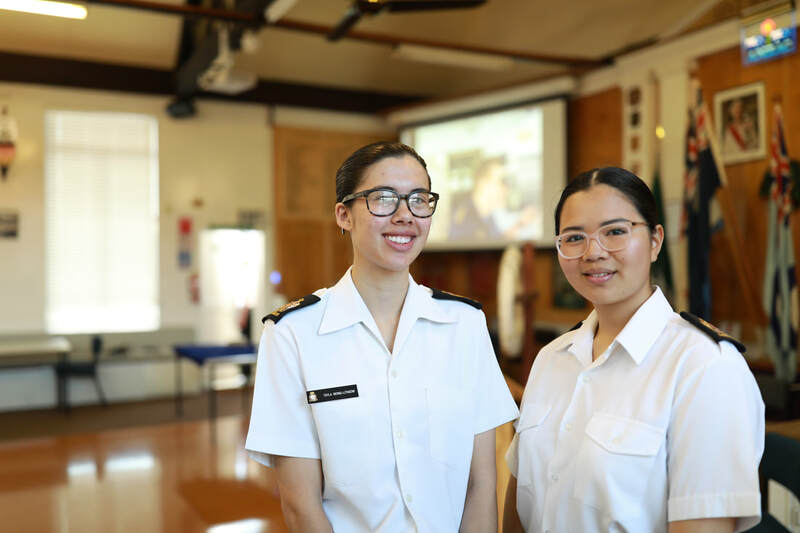 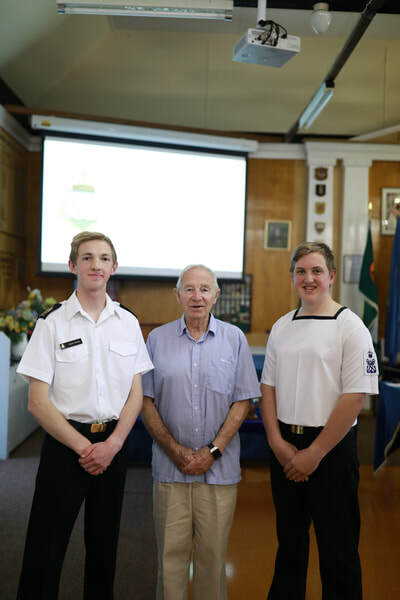 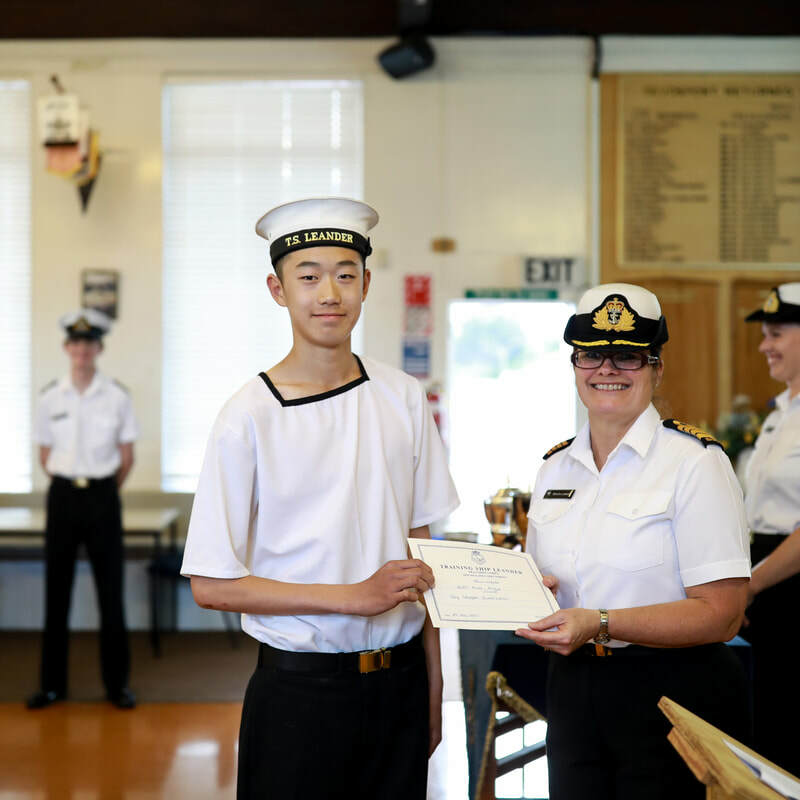 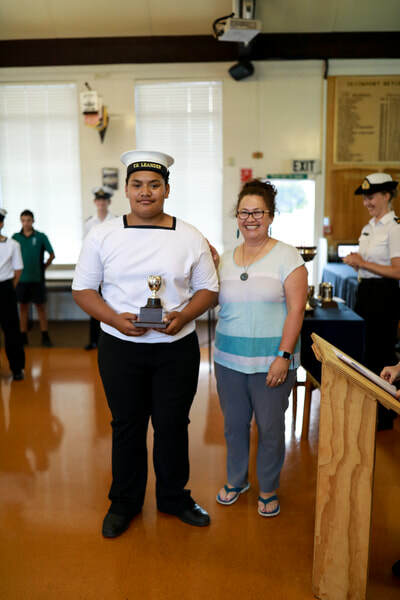 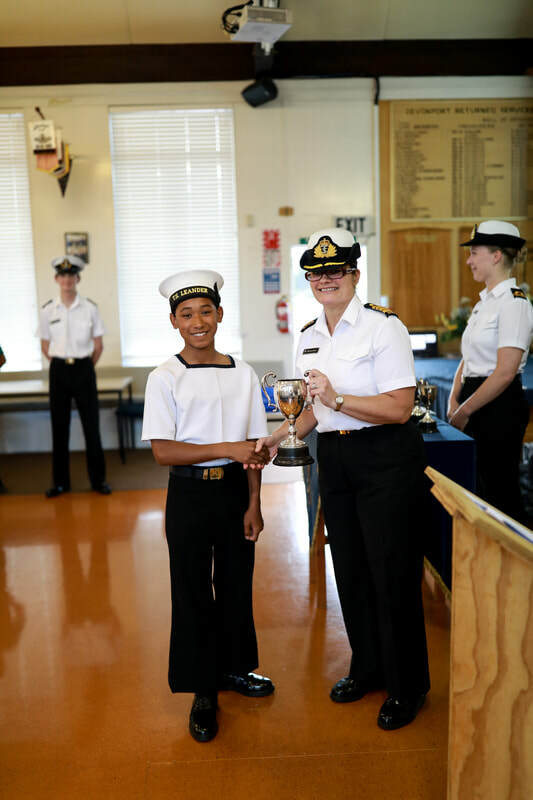 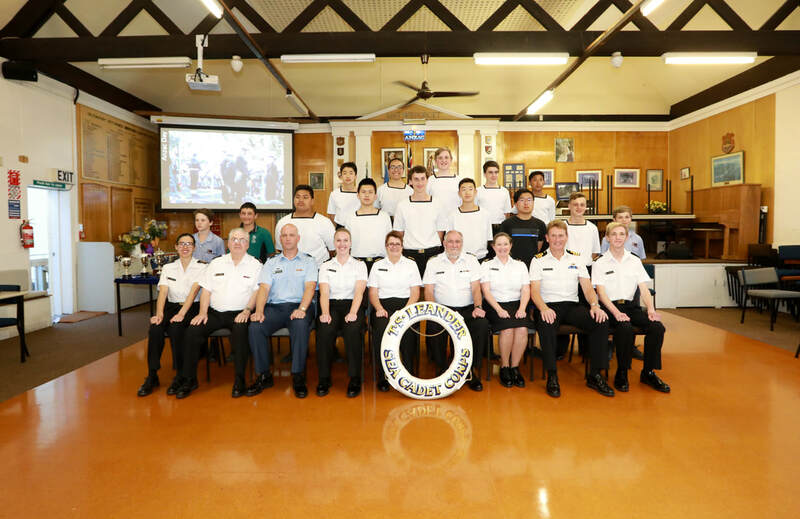 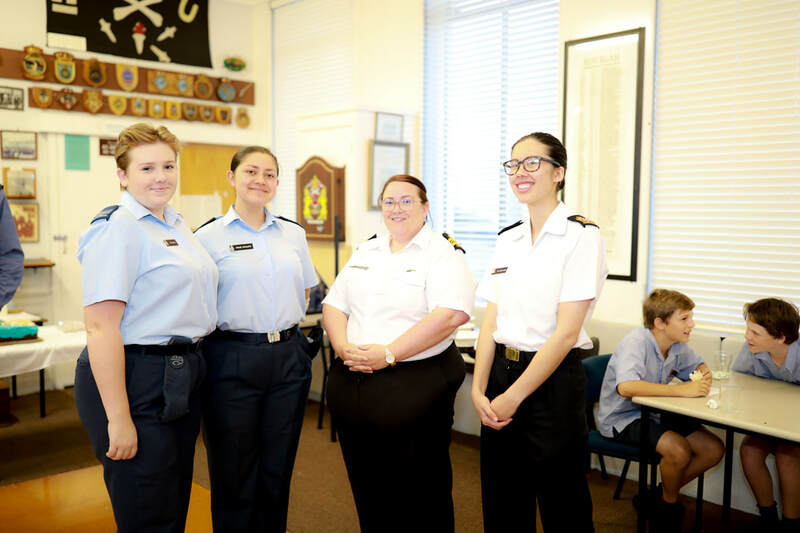 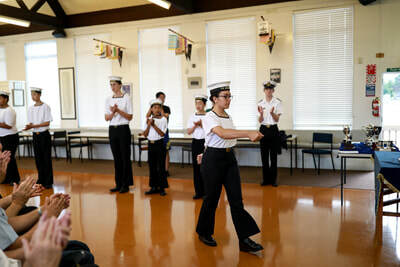 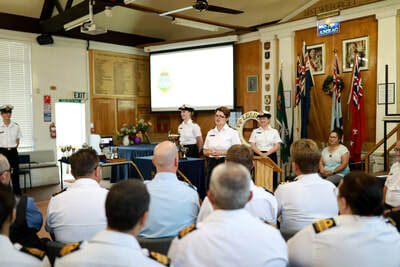 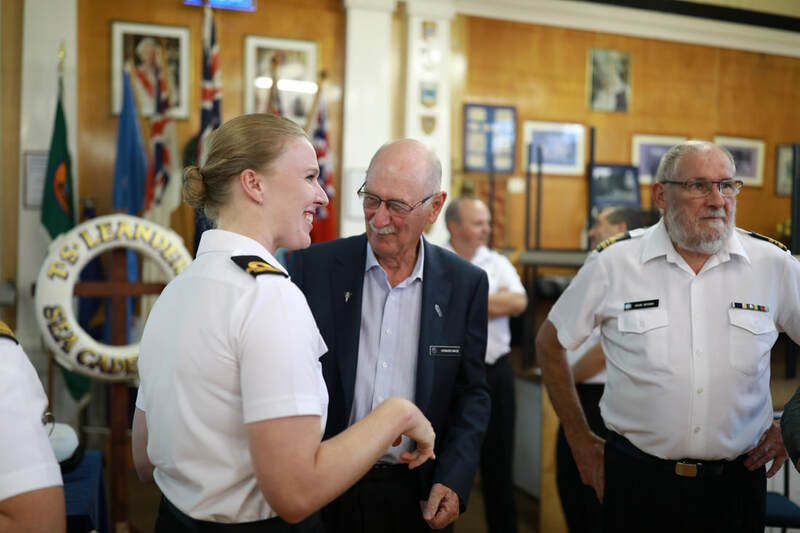 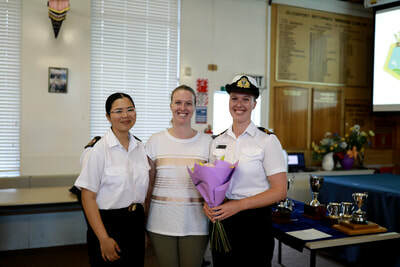 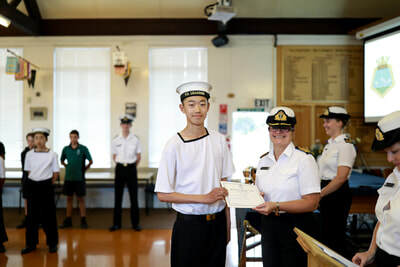 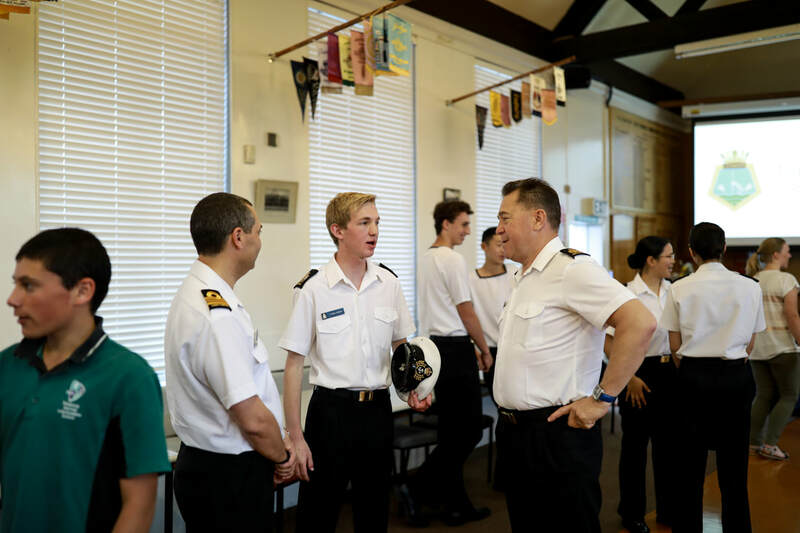 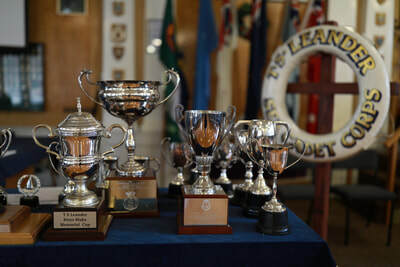 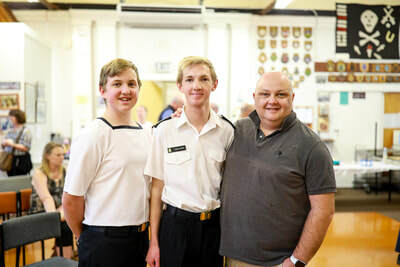 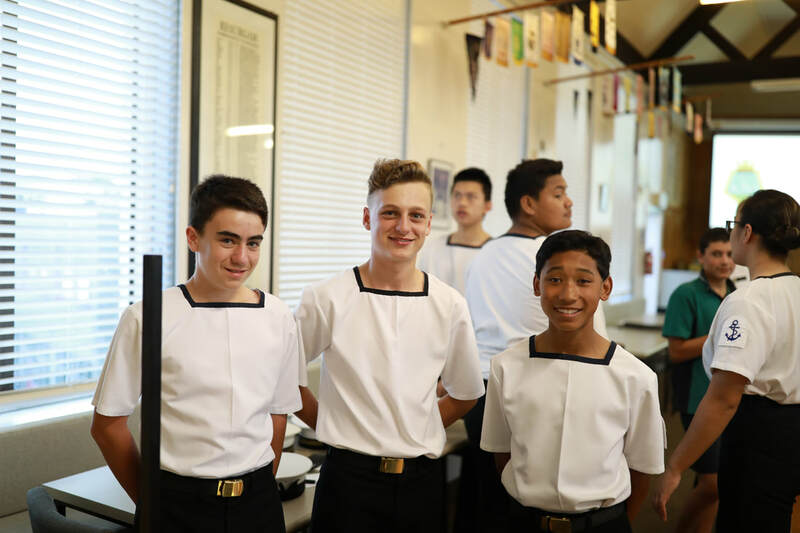 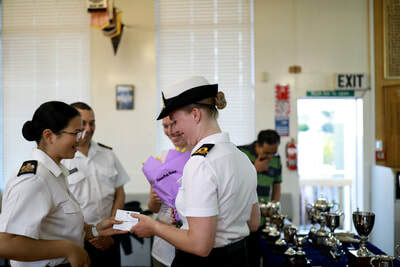 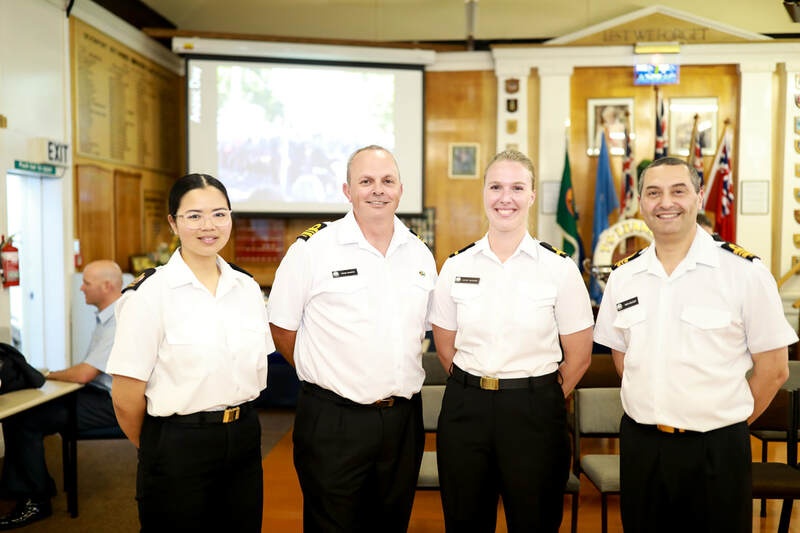 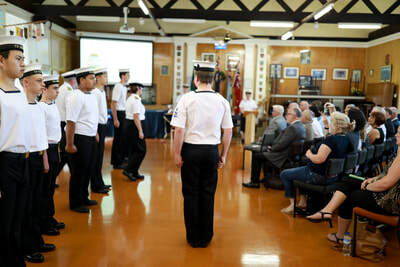 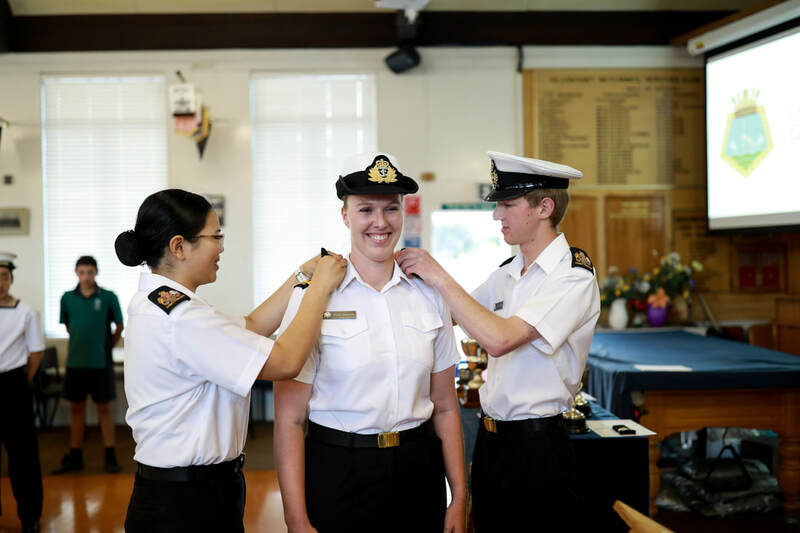 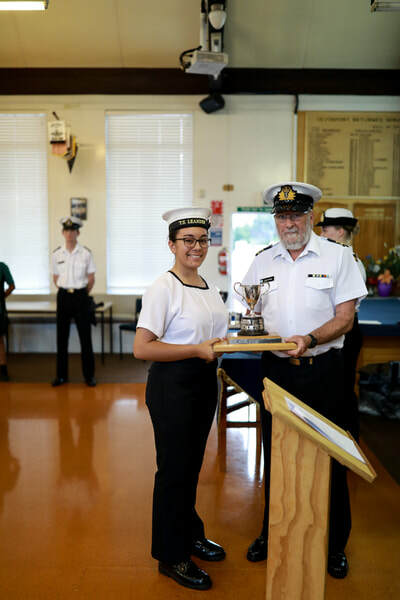 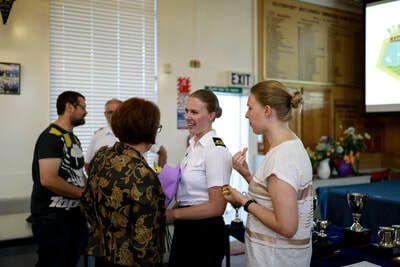 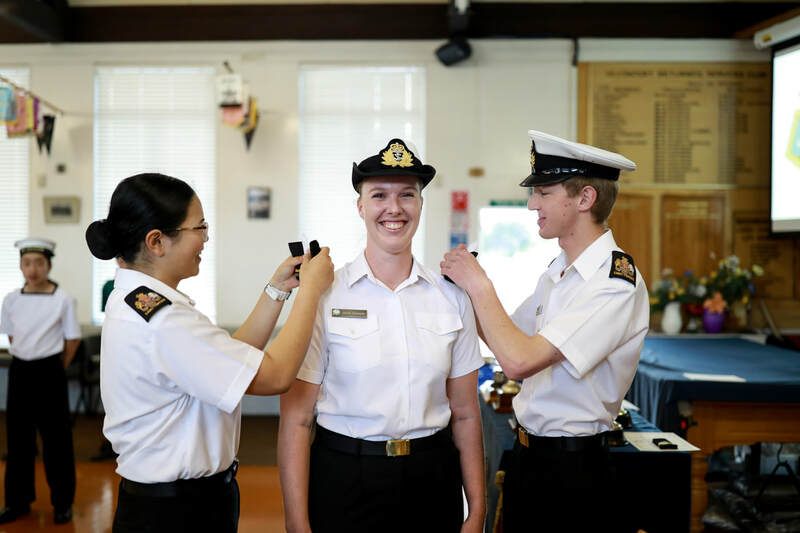 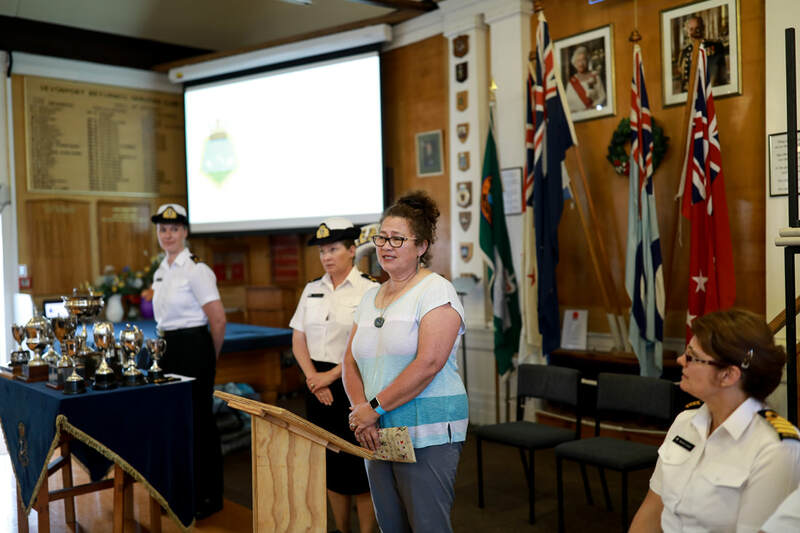 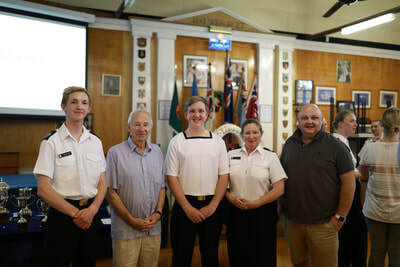 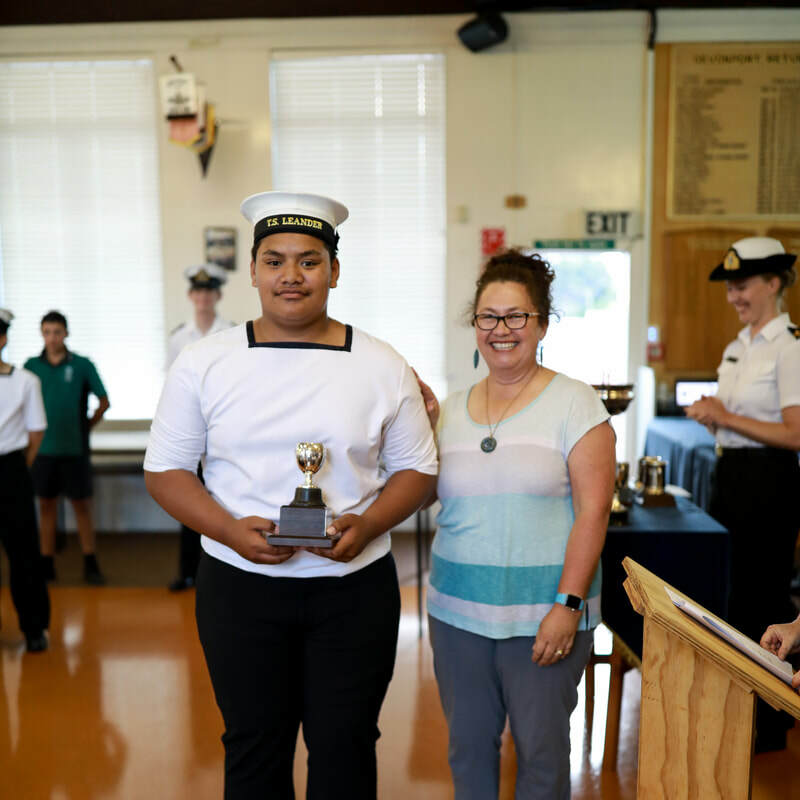 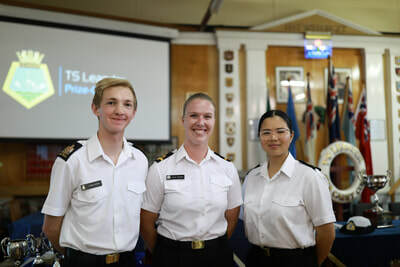 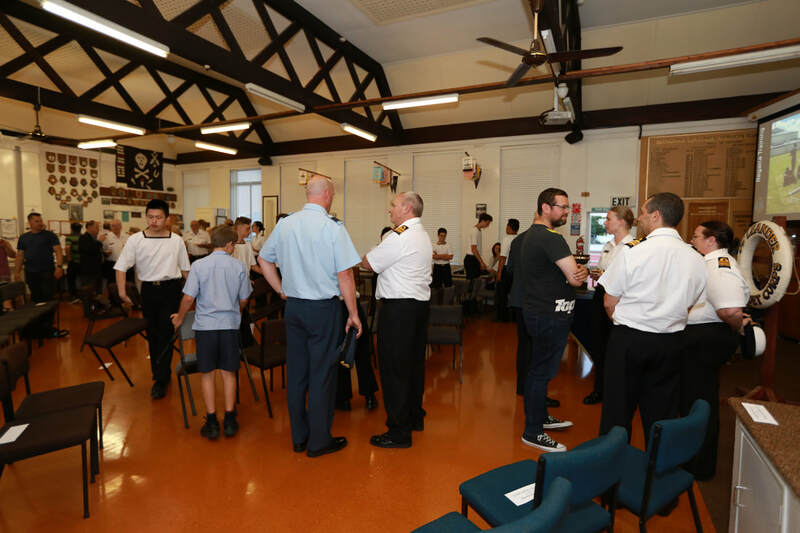 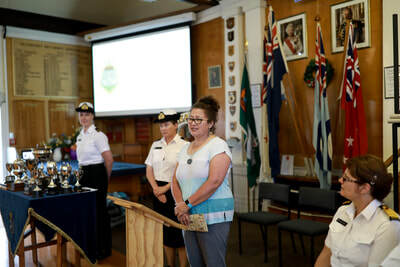 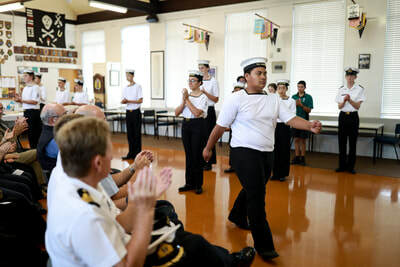 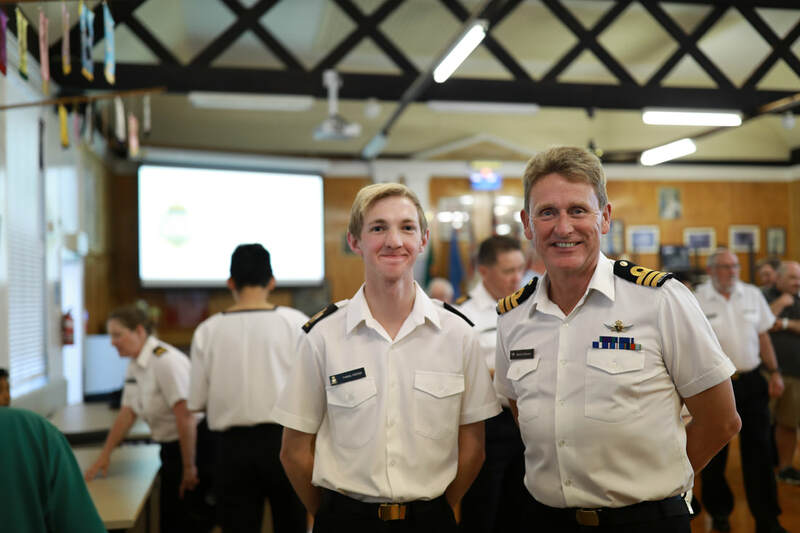 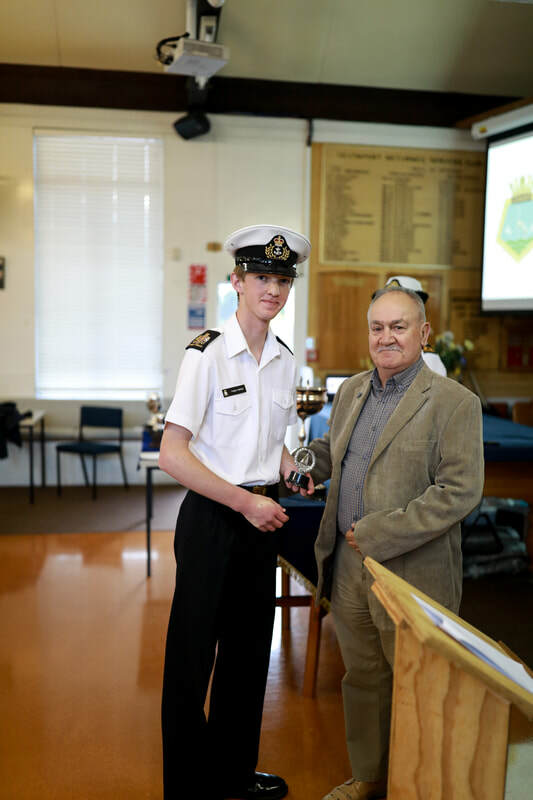 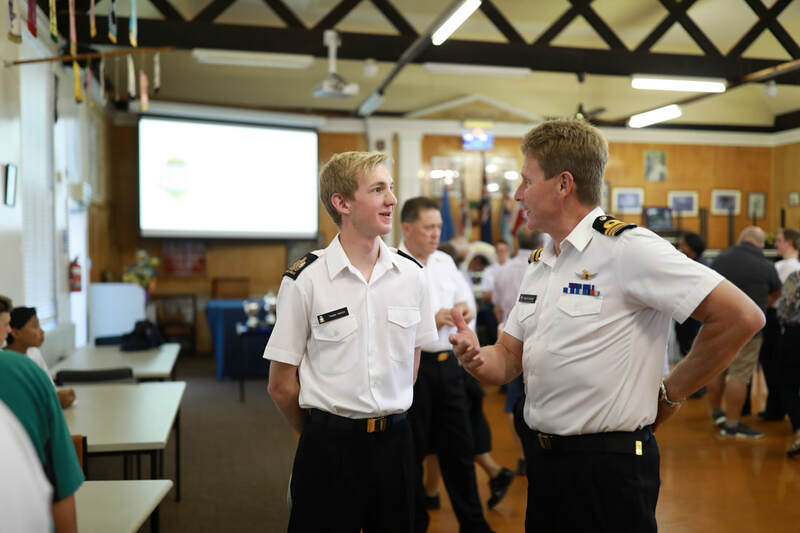 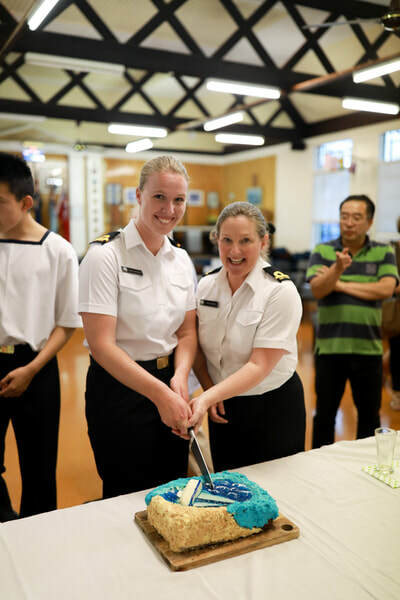 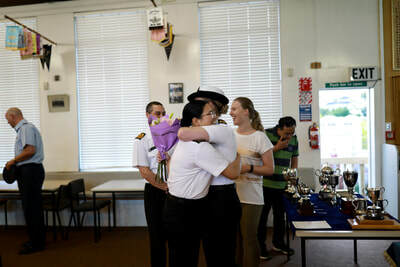 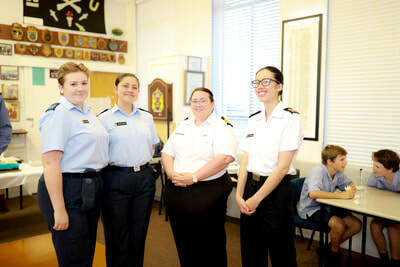 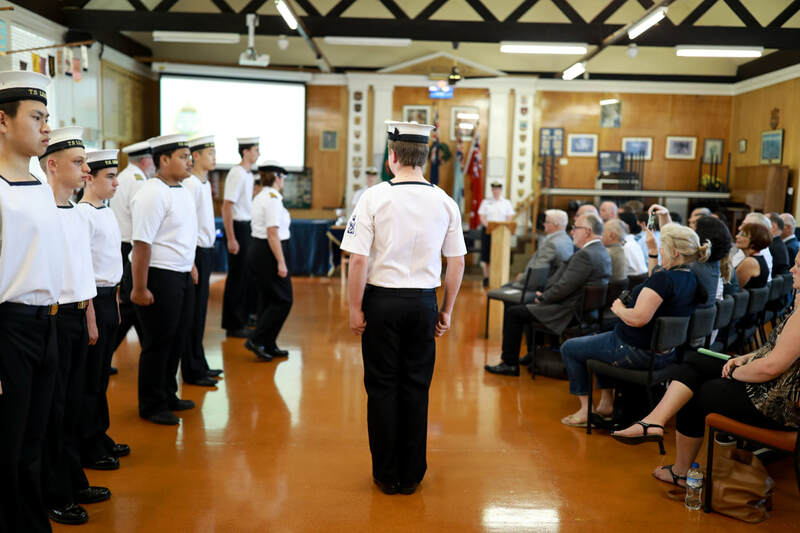 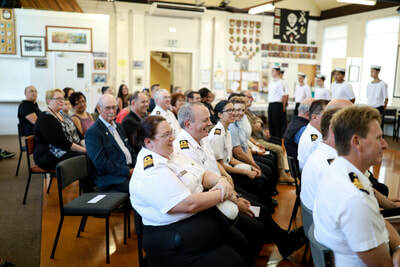 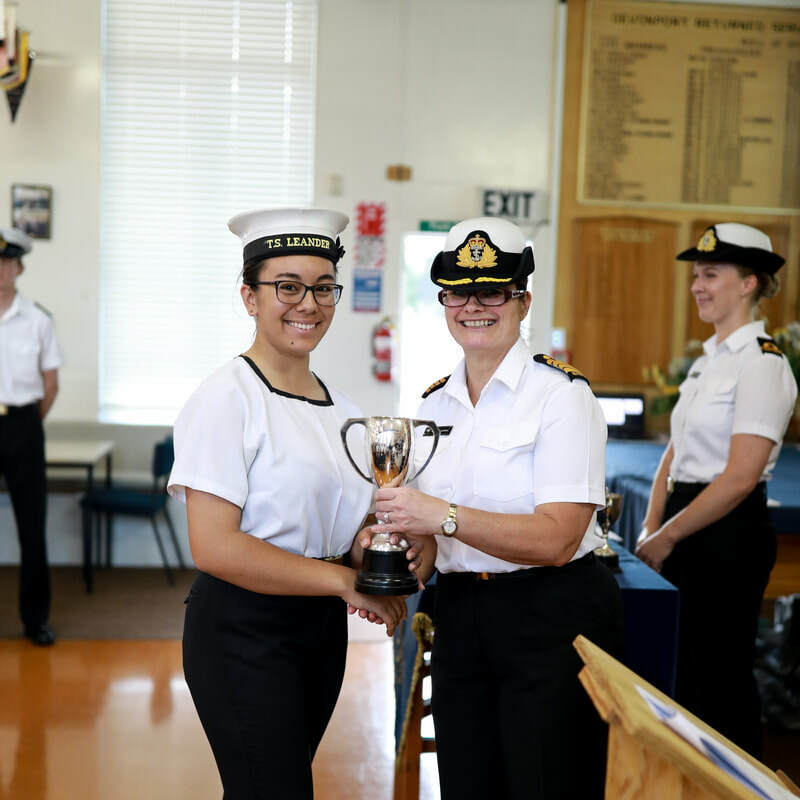 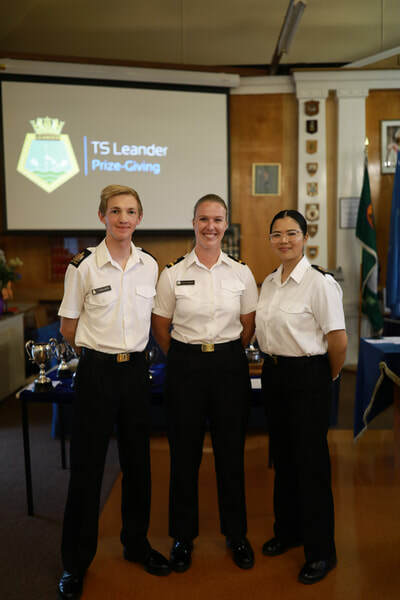 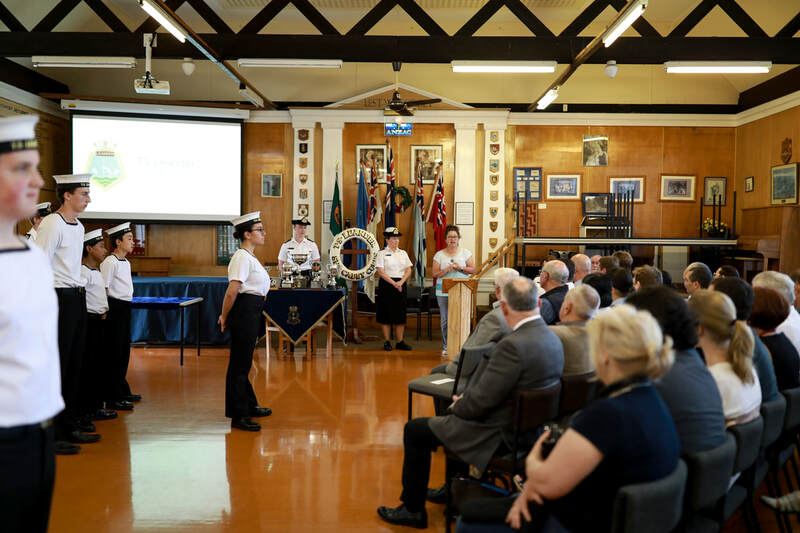 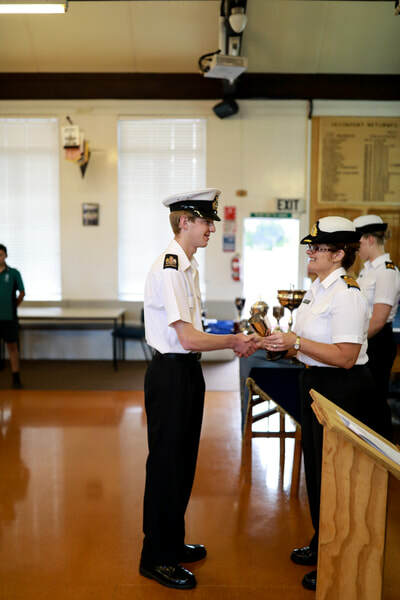 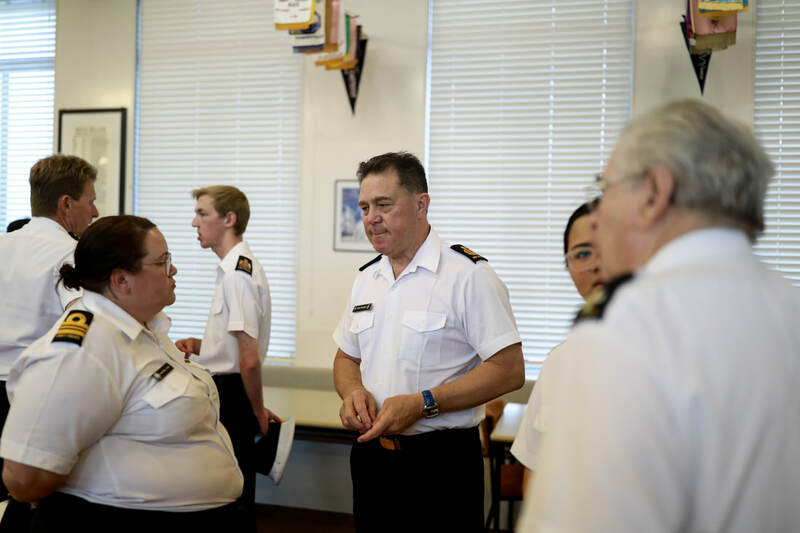 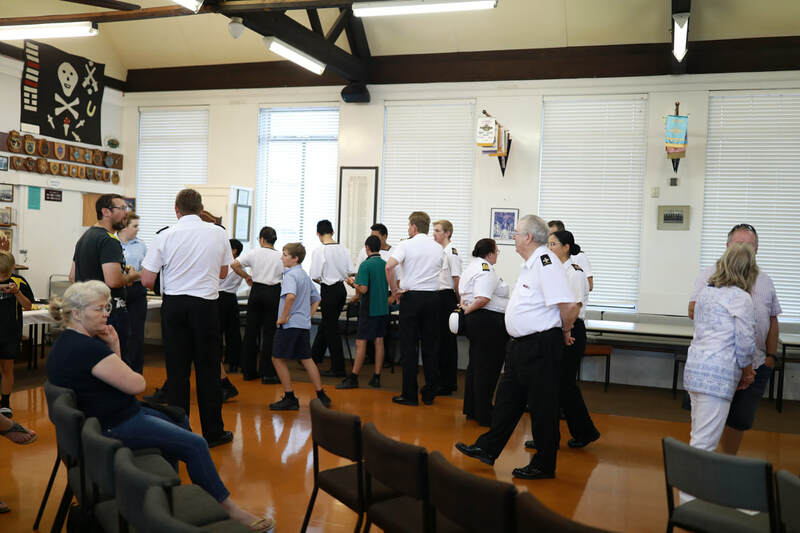 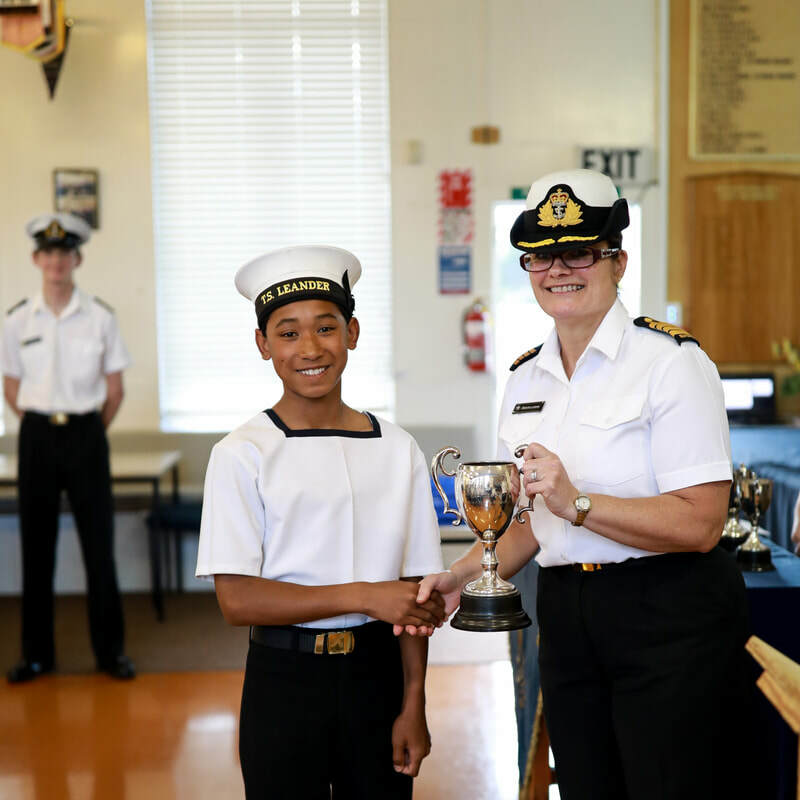 The Prize is to be awarded annually to a cadet who has inspired new cadets and enthusiastically engaged the TS Leander community to work cohesively to develop the group. 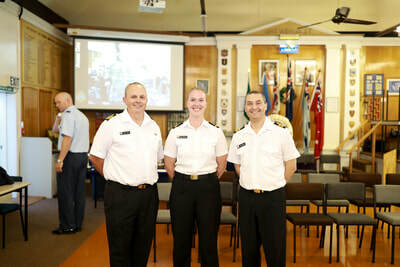 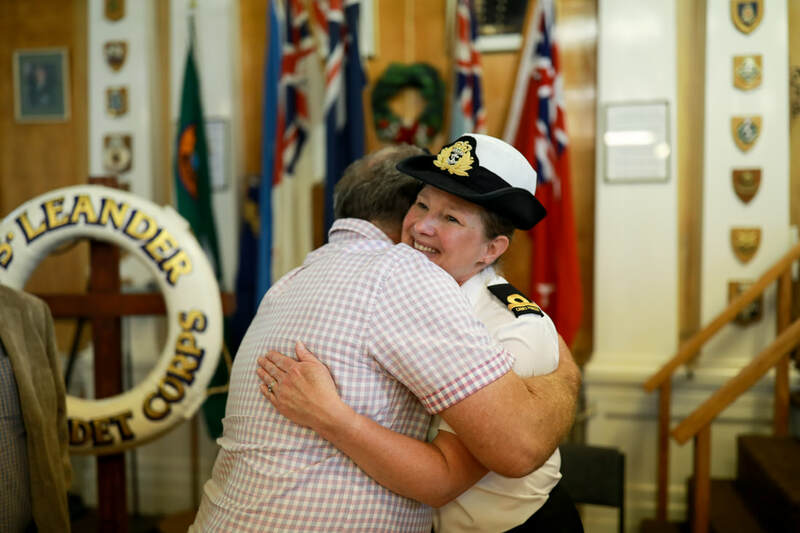 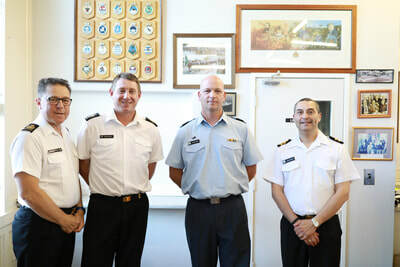 Bravo Zulu to the two new Sub lieutenants: SLt Davidson & SLt Porter! 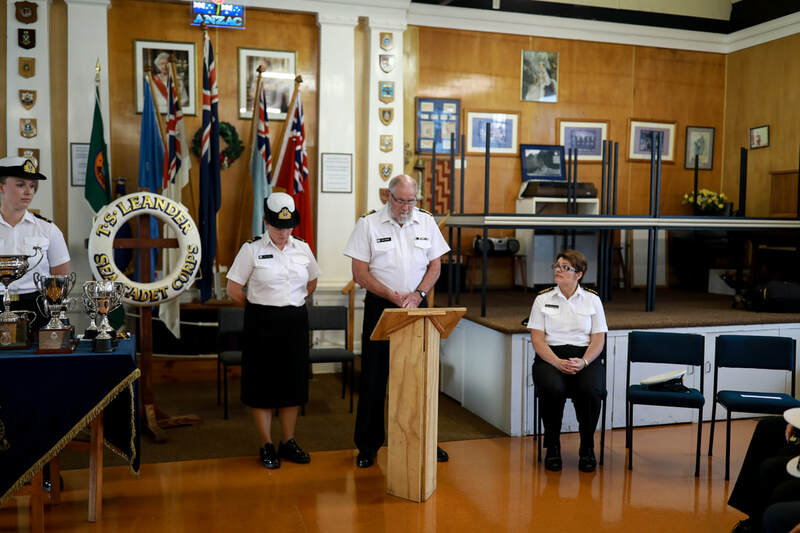 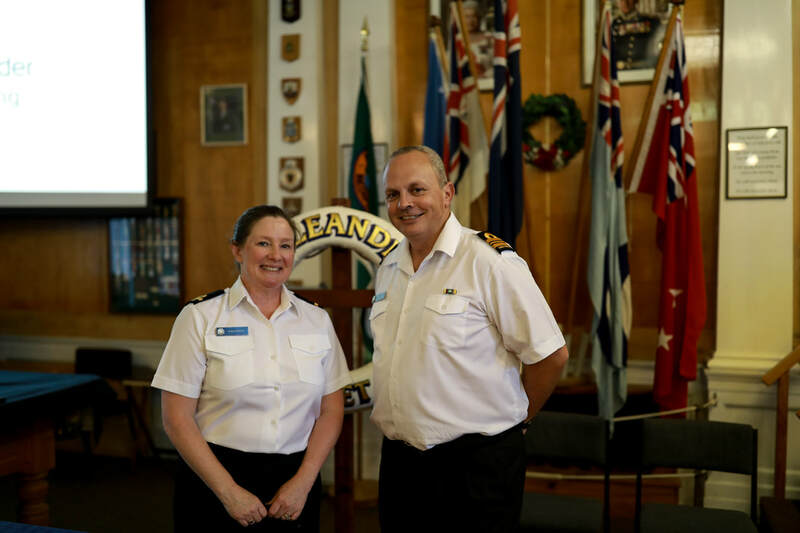 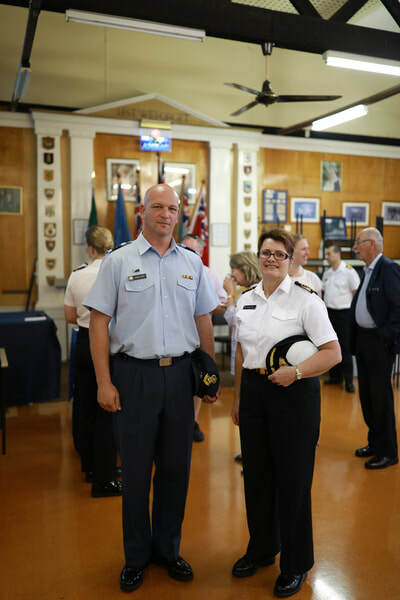 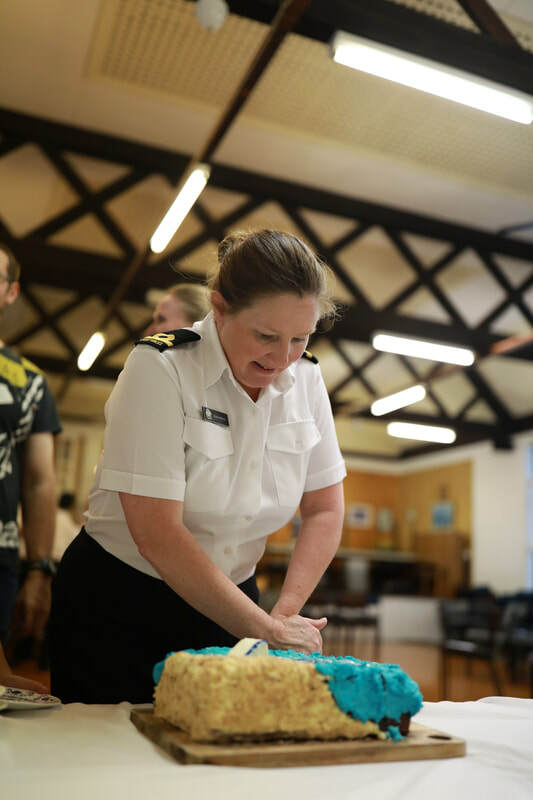 Both officers commissioned into the NZCF in November 2014, and have been an elementary part of the unit. 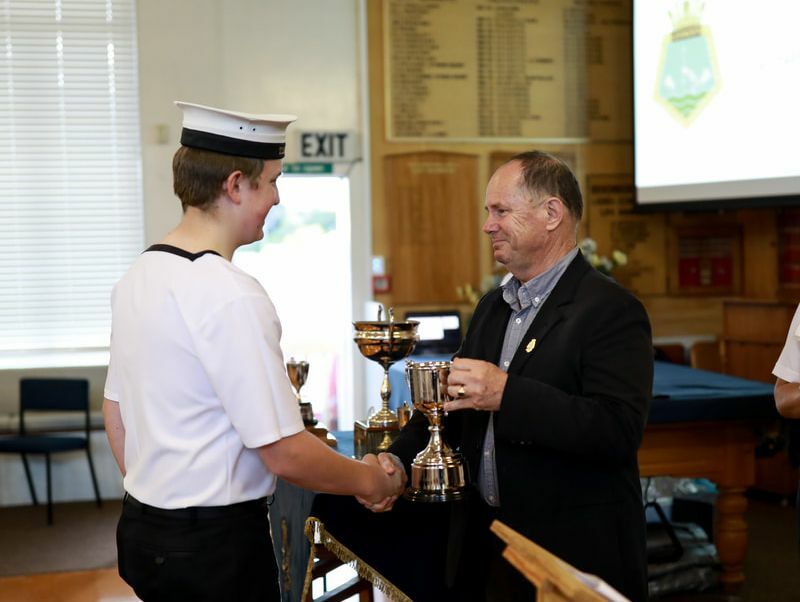 Grant Price presents the NZD 1640 Memorial Cup. 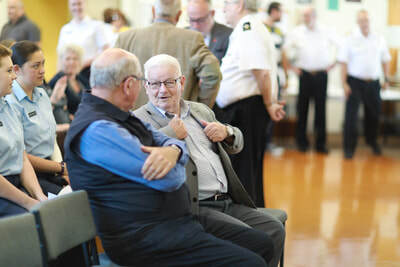 Thank you to the Devonport Returned and Services Association, for the use of theire hall. 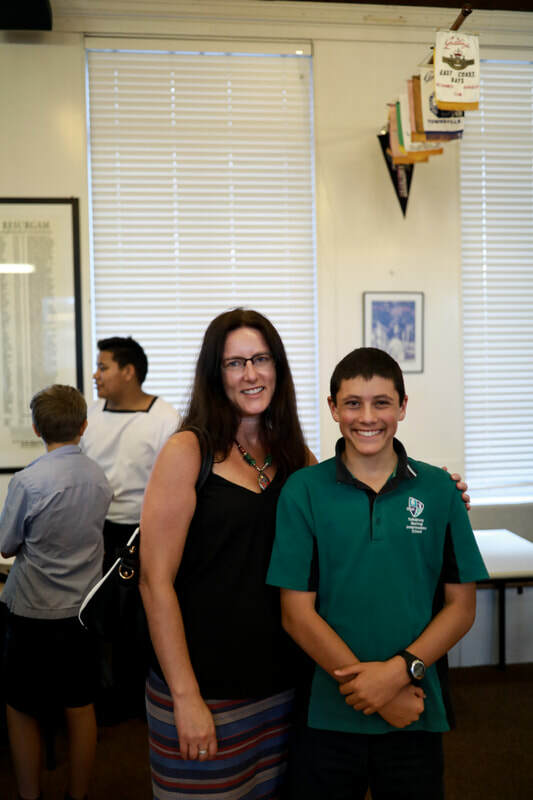 Thank you Keri Little, for your outstanding photography of the event.